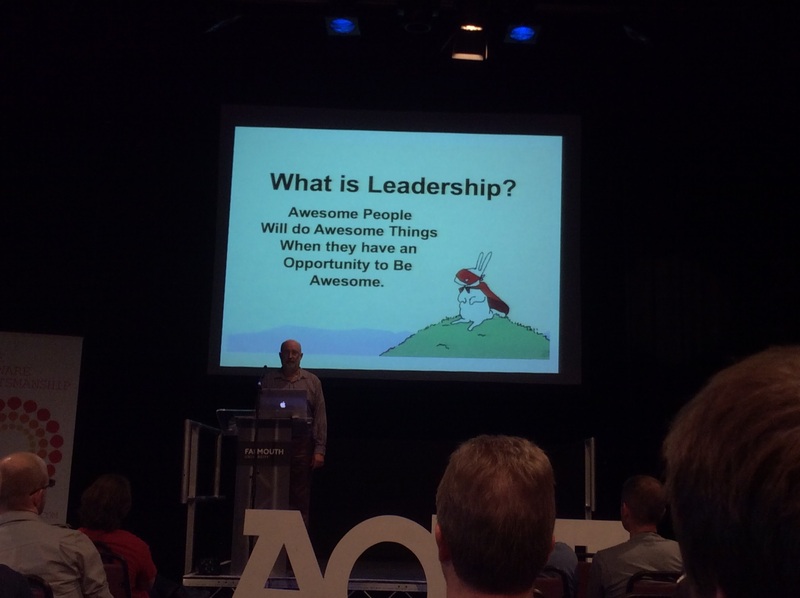 Woody starts by asking the question what is agile? Yes, it lists the values and there is a manifesto but really it’s guidelines, a philosophy. 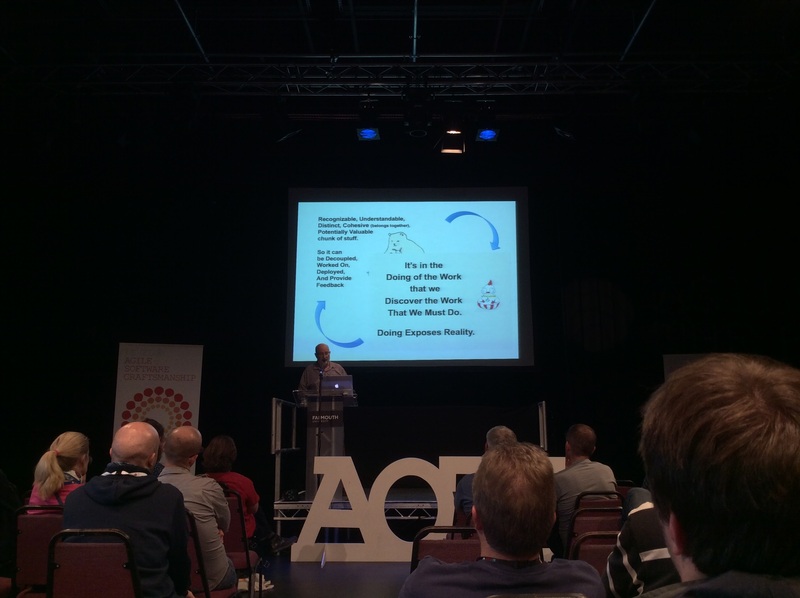 Whats actions are agile and why are they always an ever evolving set of ever evolving practices. But which practices should we be using? Going back to basics, the manifesto can guide us to these practices. 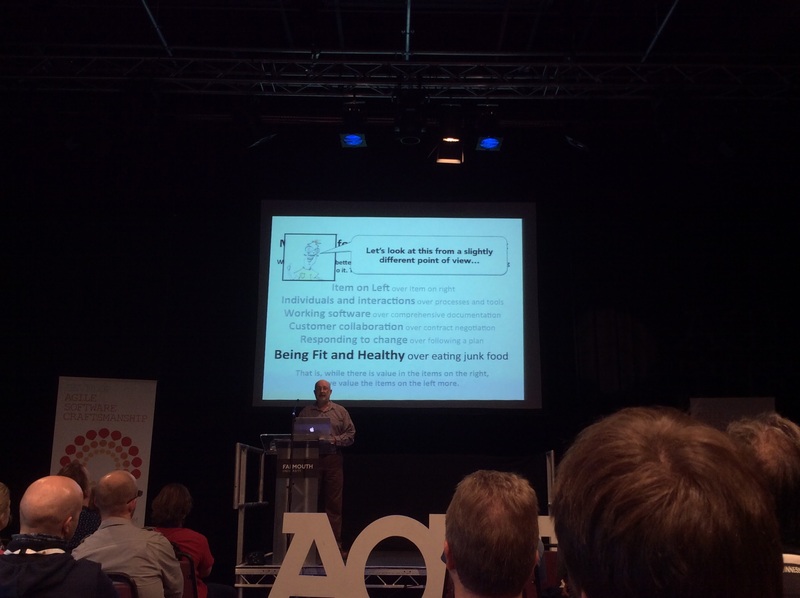 Woody calls the manifesto “the agile leftovers” – the ones on the left! 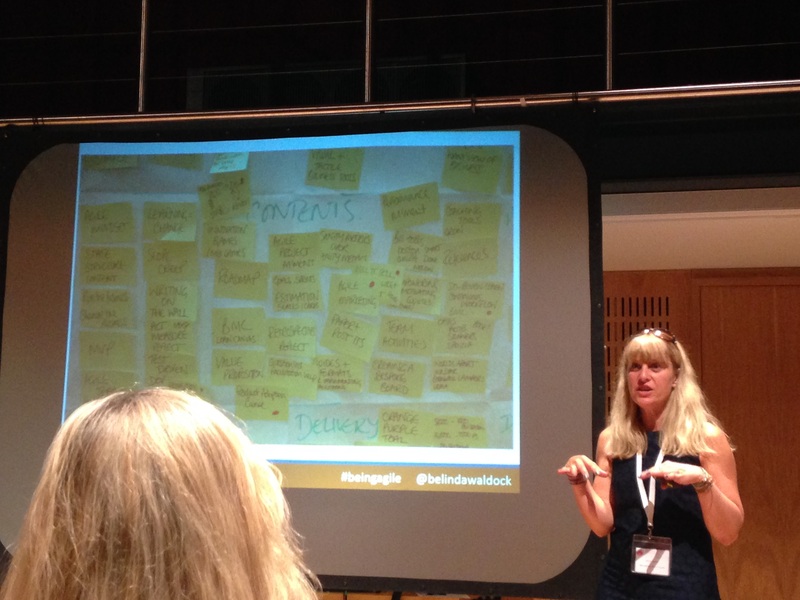 Left over… But why isn’t something as obvious as rapid feedback missing? 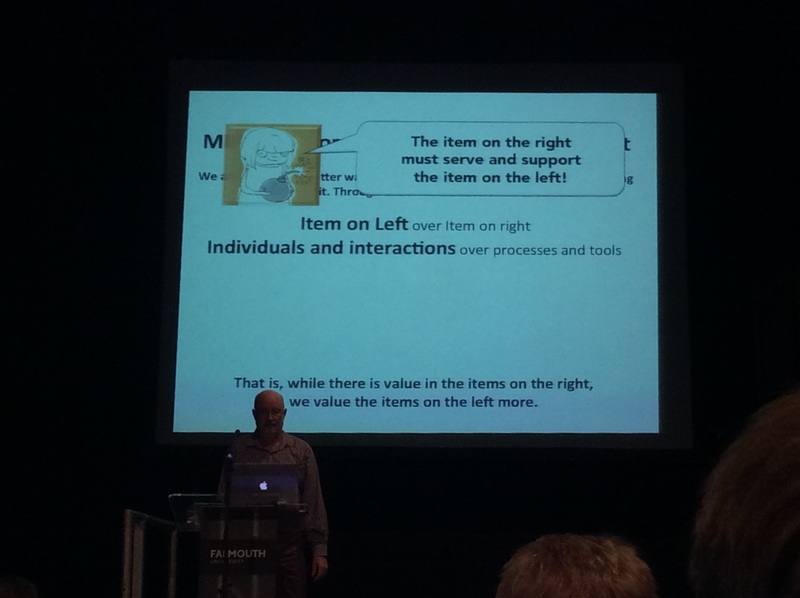 There are many ways to look at the relationship between the items on the left and the right. The left you should do, but you can still those things on the right also. 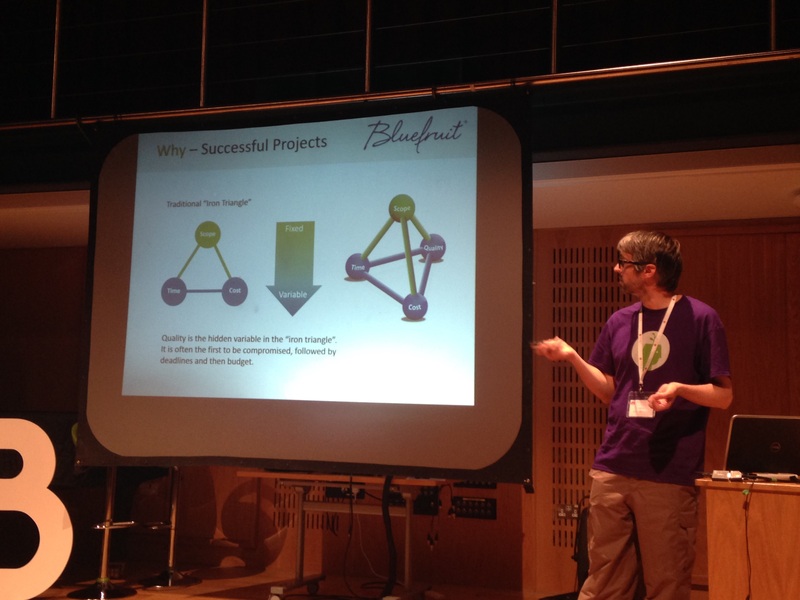 Projects need to visualise their goals otherwise they may end up like a causal loop diagrams – too many things at play! 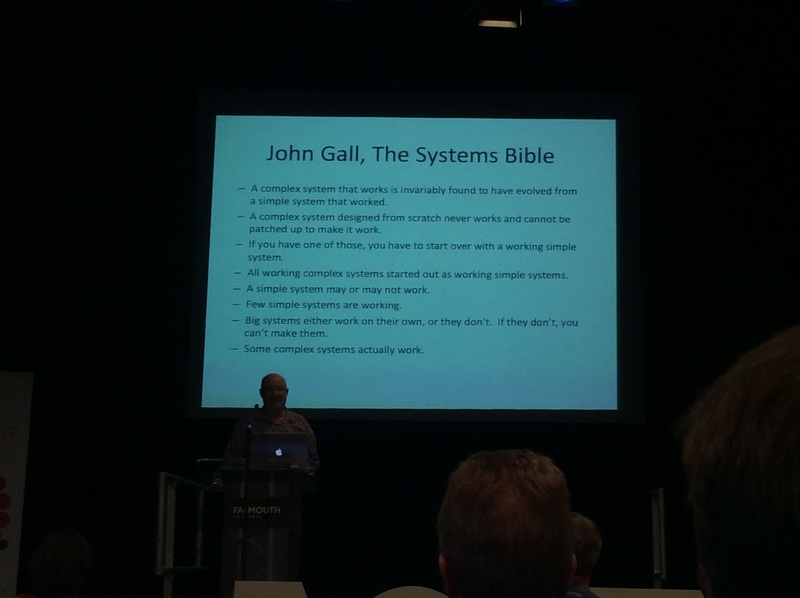 John Gall recommends starting simple and small. Get something that is right working first that is simple and then add to it to make it more complex. If you start with complex, how do you know it’s doing the right thing or even really working? The Corps of Discovery was a specially-established unit of the United States Army which formed the nucleus of the Lewis and Clark expedition that took place between May 1804 and September 1806. The Corps, which was a select group of volunteers, were led jointly by Captain Meriwether Lewis and Second Lieutenant William Clark. It was commissioned by President Thomas Jefferson and the Corps’ objectives were both scientific and commercial – to study the area’s plants, animal life, and geography, and to learn how the Louisiana purchase could be exploited economically. How do you know what should be taken on such an expedition? How can you be prepared for any outcome? You can’t be and it was only due to establishing relations with indigenous nations between Missouri and the Pacific Ocean the Corps of Discovery would have undoubtedly starved to death or become hopelessly lost. In a project description it pretends it’s all organised and tidy. It’s in the doing of the work that we discover the work we need to do. You don’t know what you’re getting into, until you’re already in it. 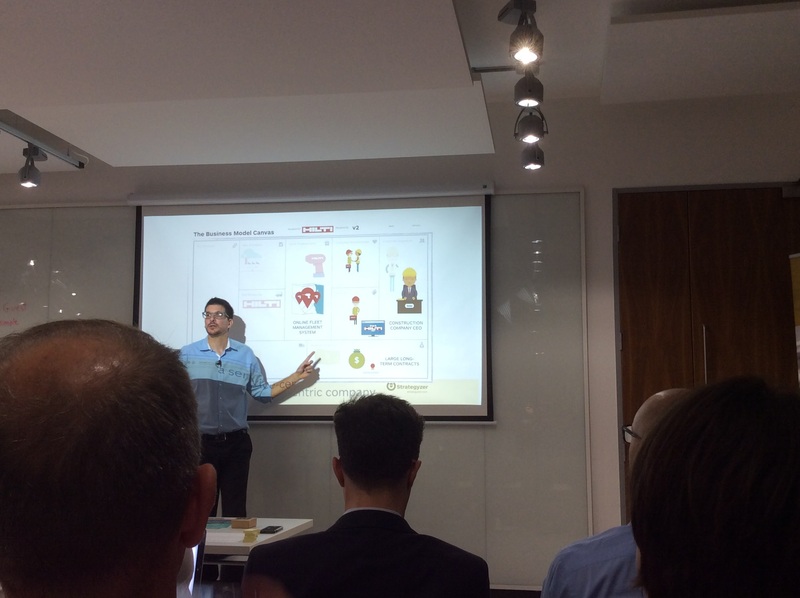 Woody talks about one of the many projects using iterative and incremental delivery. There are 200 developers working on the first iteration. The lessons learnt were that the estimates were off and the requirements kept changing. For the second iteration the lessons learnt were that the estimates were off and the requirements kept changing. They had to work harder to get better. The third iteration again had the same lessons learnt. This is the cycle of continuous no-improvement. If you keep doing the same thing, you will get the same outcome. Another project he worked on there were 12 calculations that had to be done. His team looked at this and did not understand what these calculations did, but did they need to? What was the most painful part and took a long time? The end users selected one part and told them that this thing takes an hour. They sat down together and the end users walked the team through this section of the calculations. The team worked on it and gave them end users something back to try out in a couple of days. Then they reviewed the next painful part and sat with the end users to learn more about that part. Then then delivered that part of it. The end users helped the team to understand the section they wanted to work on and the potential value, without needing to explain the how 12 calculations. In the end the team delivered about 4% of what was required and they had actually helped the team so much that the other requirements were no longer needed. This solution they had was good enough. 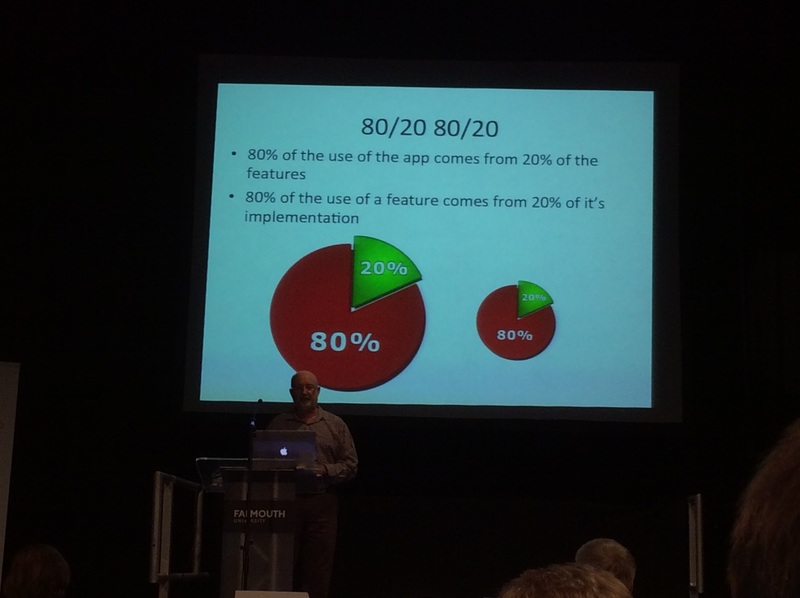 This aligns up with the theory that by doing 20% of the work delivers 80% of the value. Woody calls this “deliver features until bored!! !” You want to be able to get feedback at any moment, this way you can work to do things better. If I take a step and someone follows then you’re a leader. 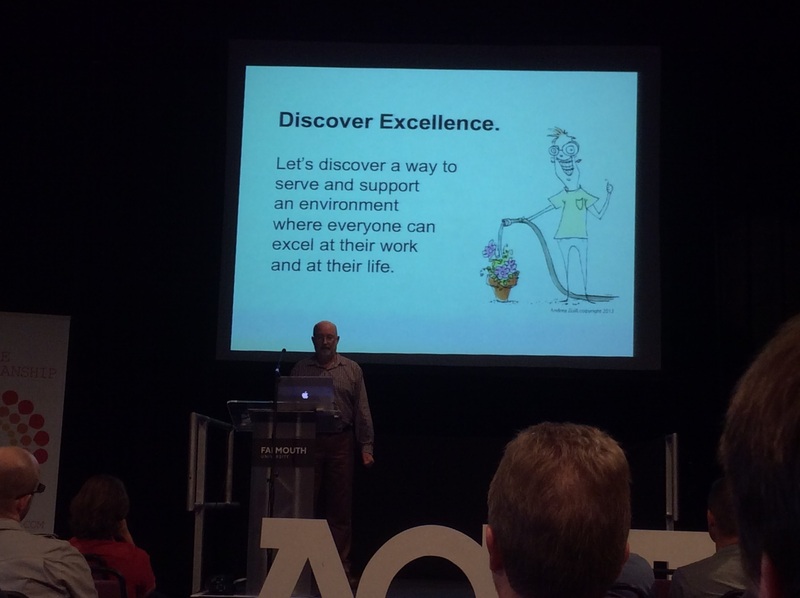 When you work you need to discover excellence as people enjoy being the best they can be at their job. 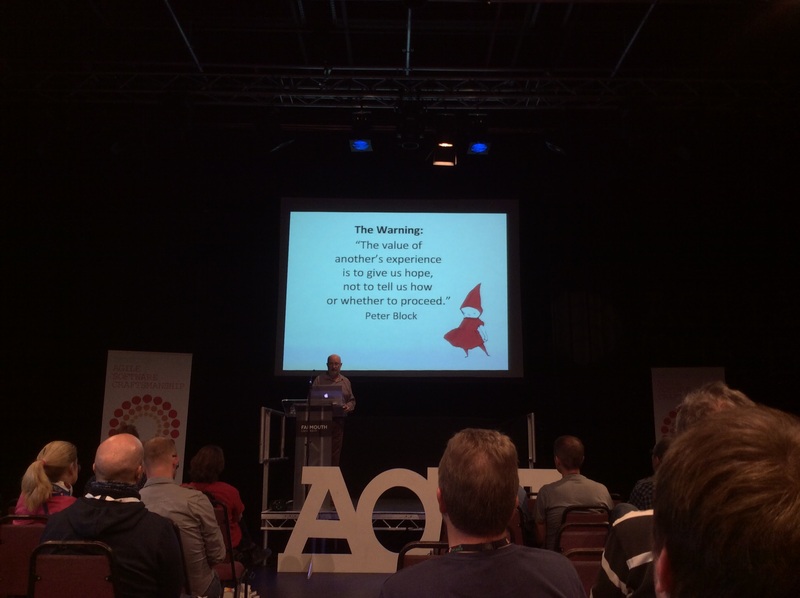 It was a great endnote from Woody but that signified the end of a great Agile on the Beach 2015. 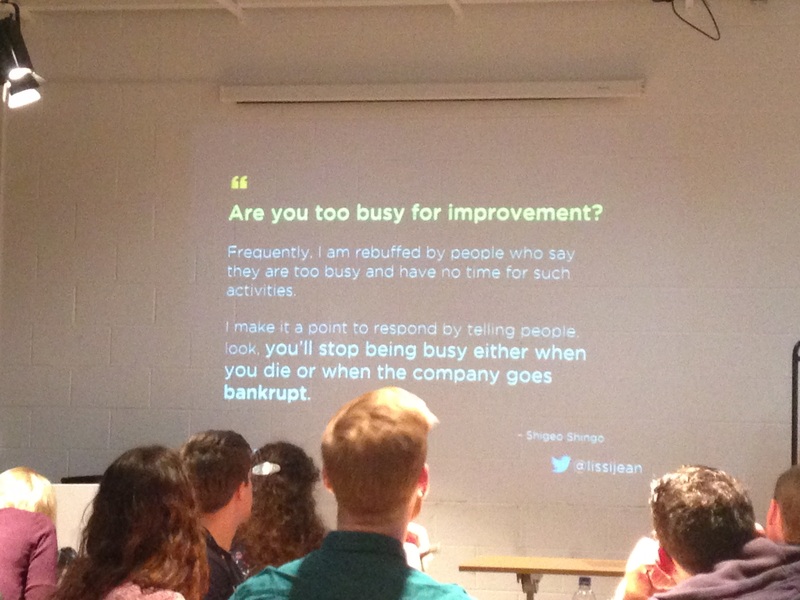 Alex works at a company called Strategyzer that gives companies access to tools and techniques that will help them design better products and run better projects. 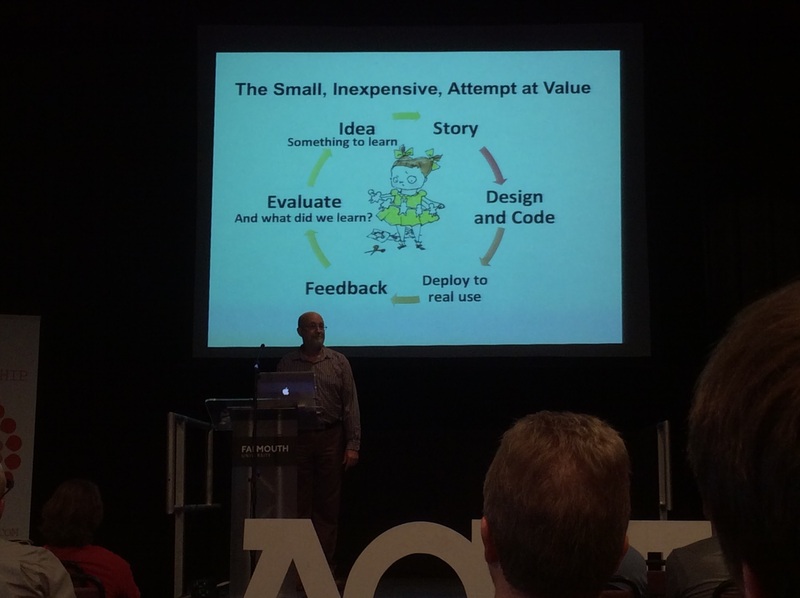 He’s written books about value proposition design and business model generation. How do companies avoid the Kodak moment, where they actually innovated themselves to death as Kodak realised too late that they had no business model for digital cameras. 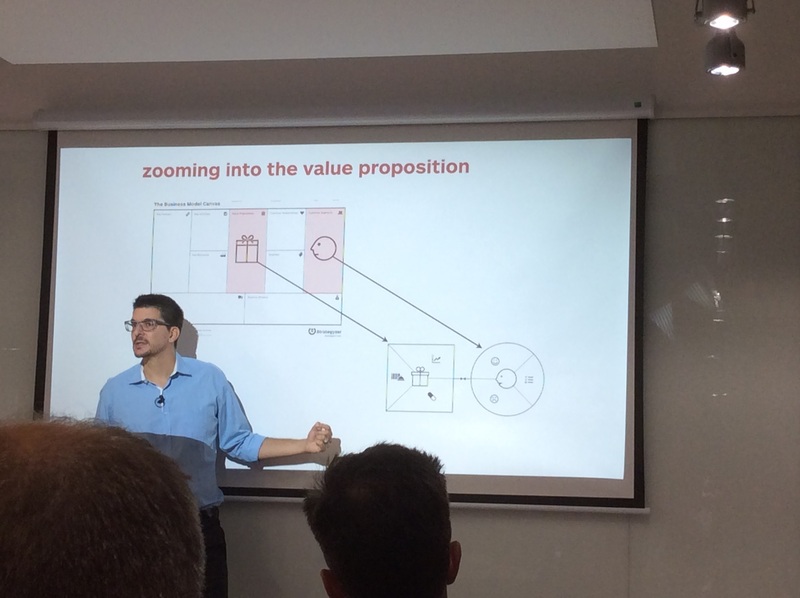 How much goes into finding the right business models and value propositions where you work? How do you go from an idea to a business? Does the company appreciate that it’s not a linear line! Large companies that use a business plan, need to burn this! There is no chance you can make those exact numbers and you don’t want people to buy the numbers you want them to buy into the product. 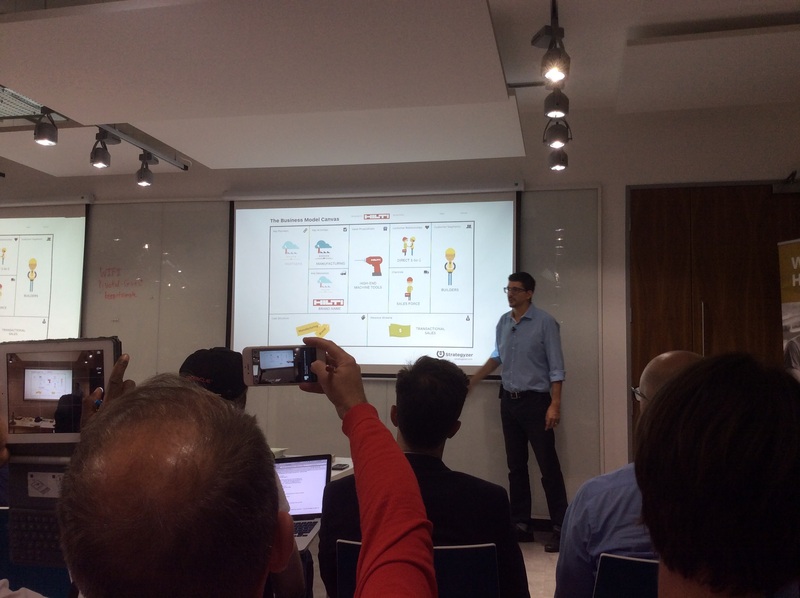 Companies need to search for the right business models, design something, test this (search), execute. Don’t only test out one idea but also think about what are the alternatives? Then test these out as well. Look at surgeons, it is the age of the innovation surgeons, who use tools to do there job. They don’t use tools from 1985 as the world has changed. They also don’t use one tool for everything, there are specific tools for different surgeries. 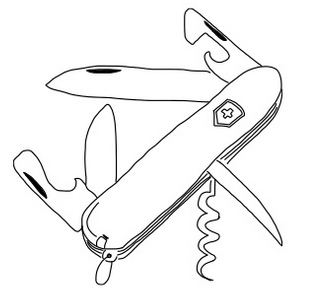 Would you let a surgeon operate on you with a Swiss Army knife? Probably not. Surgeons have also had many years of training before they qualify and they use this experience to make decisions to the best of their ability. What they would do in their first year as opposed to their last year it different. It is the same with other jobs, you need to learn from the time you have done the role but be aware that things are changing and what was right then may not be the best way to do it now. 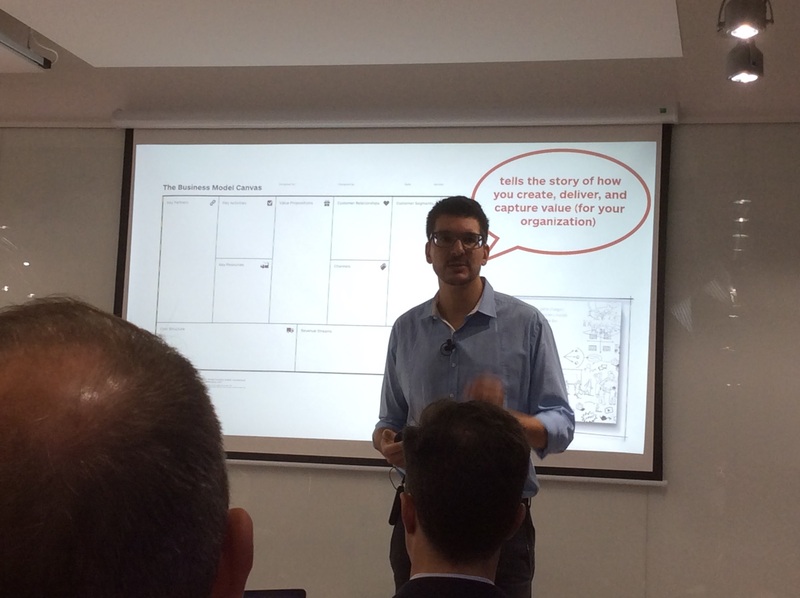 The Business model canvas tells the story of how you create, deliver and capture value for your organisation (not for product design). Again one tool doesn’t do the whole job and it’s not about industry specifics anymore. Different industries may have the same drivers that create value. There is the front, the theatre and the back part (spending money) of the canvas. People need to think big picture. 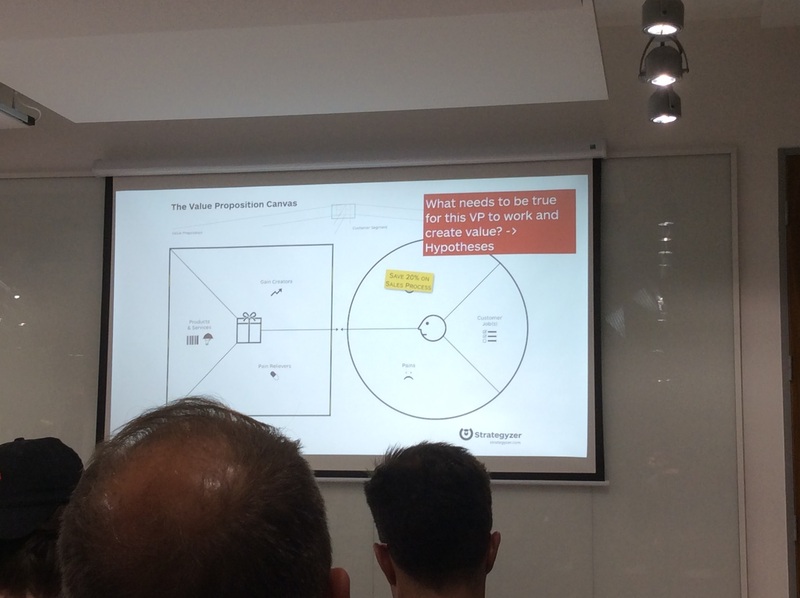 There is also the value proposition canvas which has the customers at the centre. How does the product create value for the customer or for the business? Instead of having a conversation, create a visual shared language, like a map. 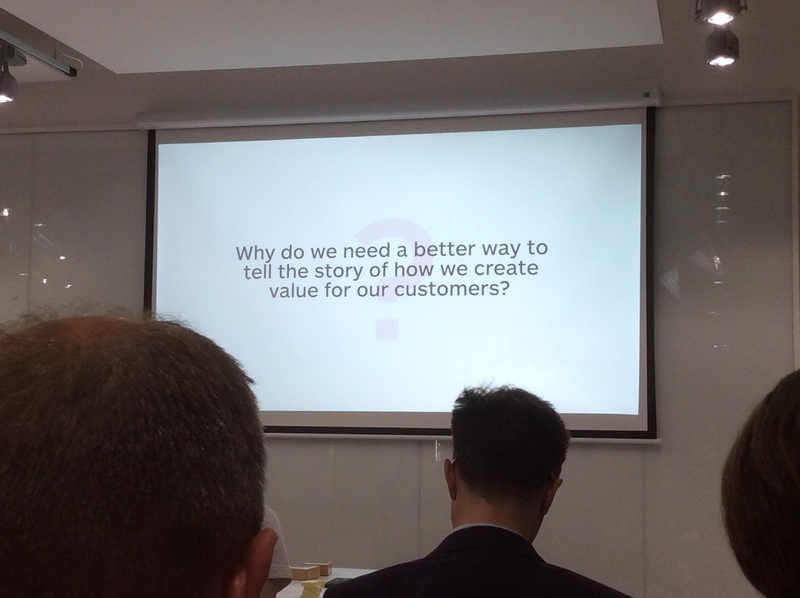 It is telling a story on how they are creating value for their customers. What are the customer jobs to be done as these are the centre of value propositions. 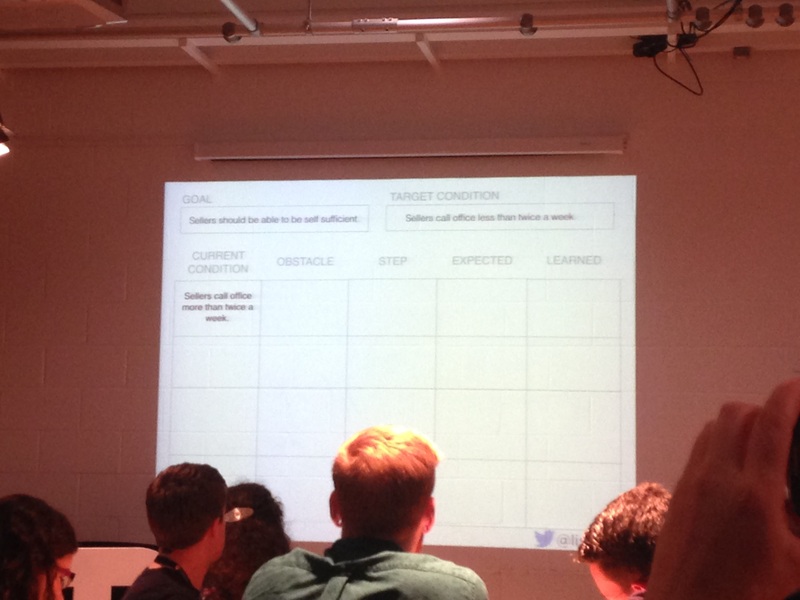 From here you create an empathy map, what are your customer’s pains and gains. 2. What does success look like – how do they measure that? 3. What does failure look like? Do you want to create a better book or is it so existing solution so broken we need to change the playing field? For example how are people learning, maybe a book isn’t what is best, maybe videos are a better media for? Giving them value is actionable items. When you talk to your customers limit the options as people don’t know what they want. Don’t talk about wants or solutions but instead ask what are they trying to get done? Move the focus on the customer jobs. 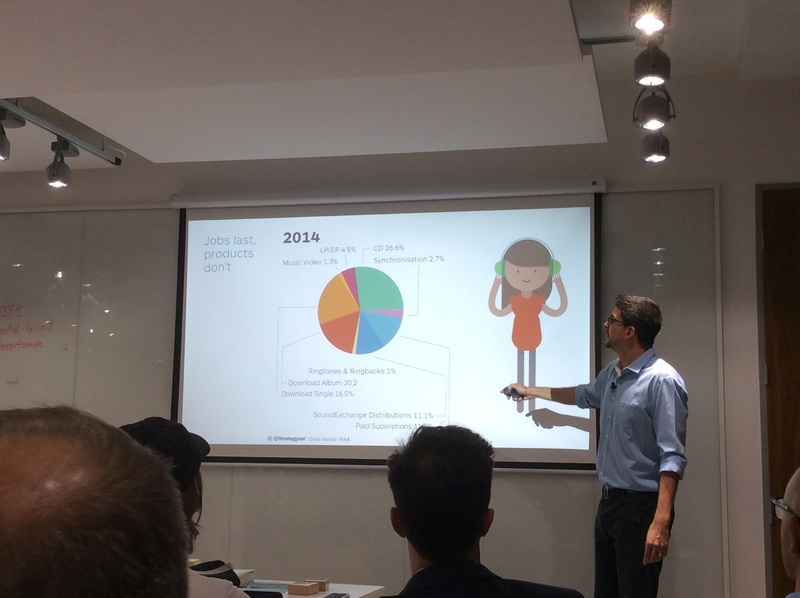 Personas can be job based segmentation, similar work means similar pains and gains which can be better than segmenting on socio-demographic profiles. What are you going to pack for your business trip? Think of the music industry, the job never changed (listening to music) but the solution didn’t. made the milkshake thicker, the straw thinner and put fruit chunks in it. All these things made the milkshake last longer. They tripled the sales without talking to customers. They could sell this to more than just the milkshake market but for breakfast snacks market too. 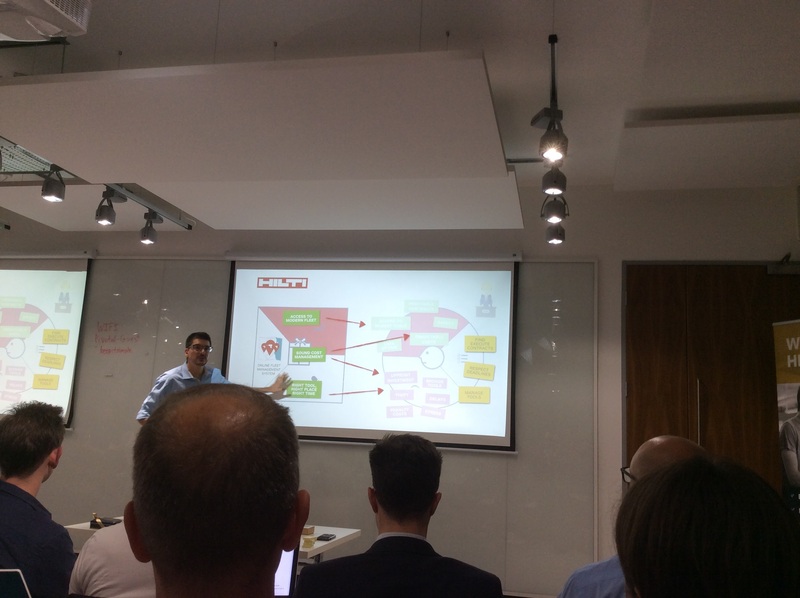 Observe the customer, fit and map. The jobs don’t need to be linked to pains and gains but you do need to rank and prioritise them. 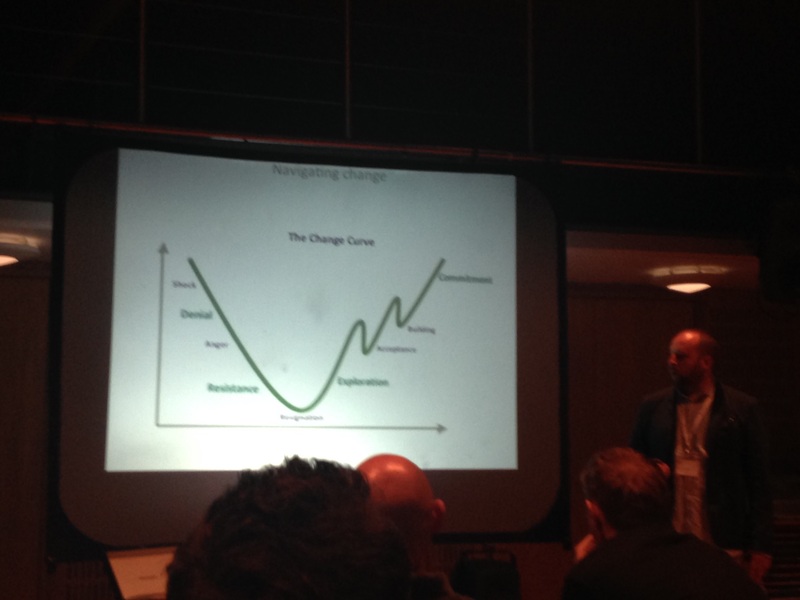 The content will change but the value map won’t, keep iterating and improving when you get feedback. Make sure the issues are not too specific with a job as some people think jobs and gains are the same. The gains need to be measurable and jobs are a verb and a task. These jobs need to create value for customer and which pains/gains are they addressing? If you look at Hilti – they make machine tools for builders. 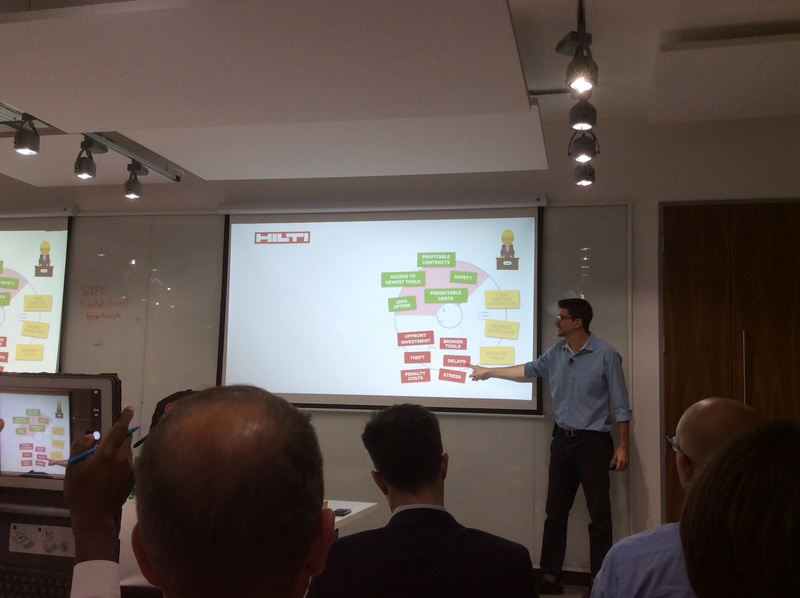 They learnt about their customers and realised that the main issue is around maintaining the tools. There needed to be sound cost management. 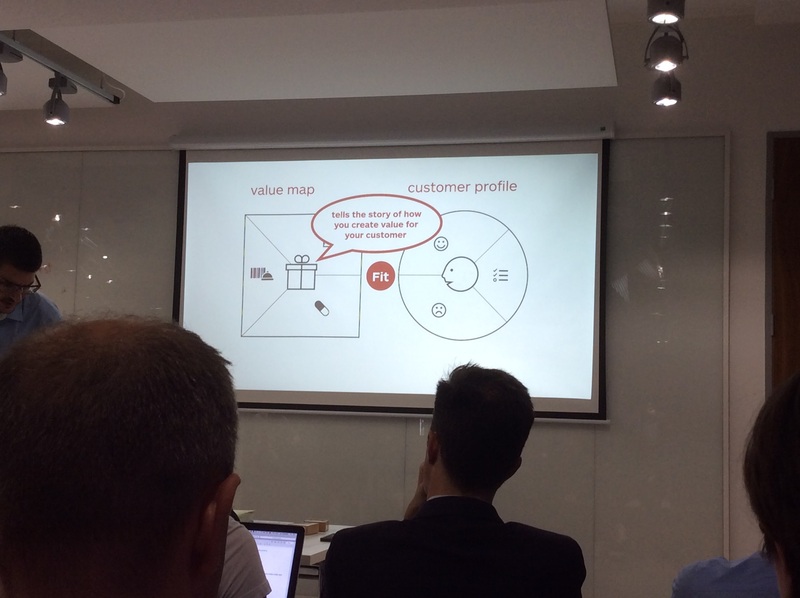 You need to make it explicit how you are creating value for your customer. It should be visual and able to pivot the information. Focus on few jobs and do these well as you can’t address everything. 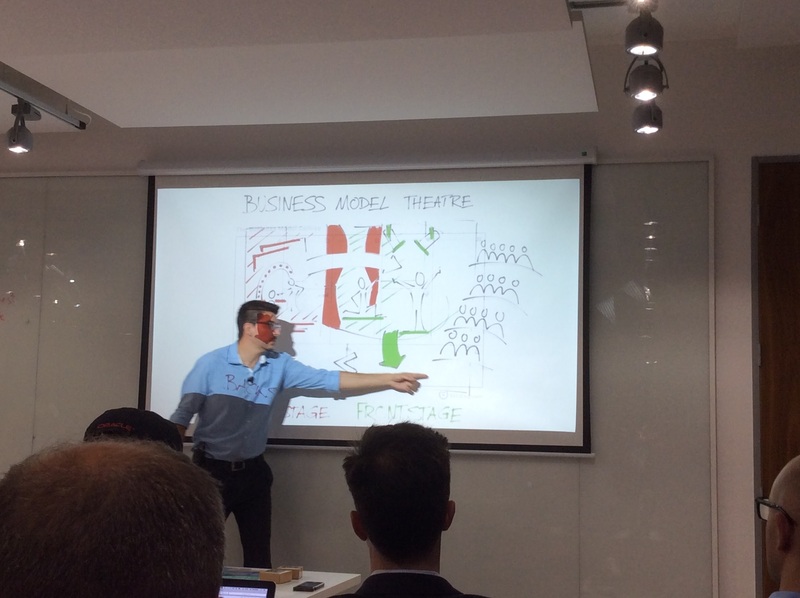 As the value changes you need to update business model, what’s the impact. The challenge is to create a dual working practice. To improve or invent? 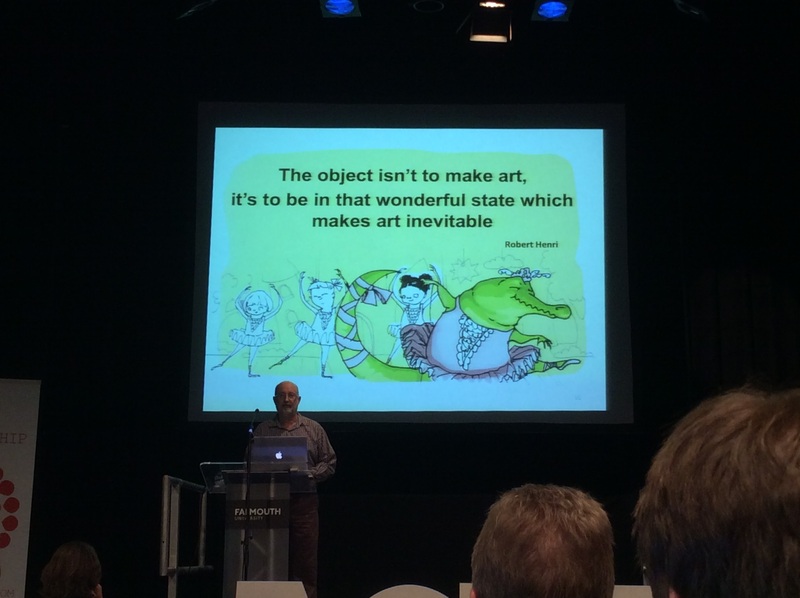 To improve incrementally is known and predictable but to invent and experiment, it’s new and unknown. You can’t predict or search for business models that work. Detailed plans are worthless. You need to test a hypotheses. To invent is a different system. 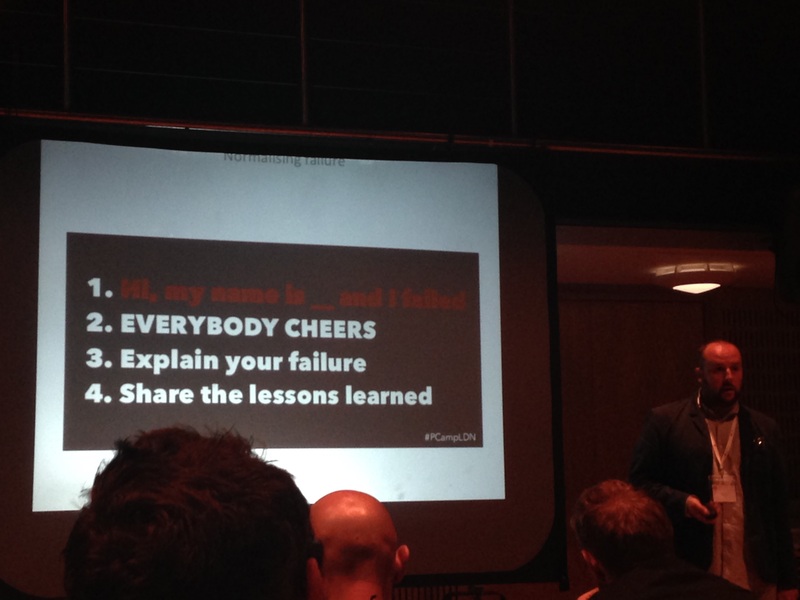 So why do businesses really fail? Because they build the wrong thing.. 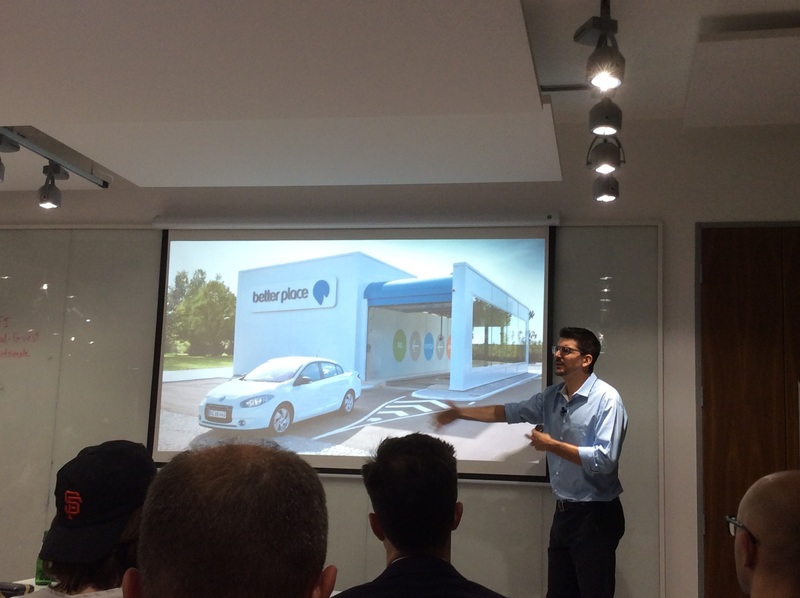 Better place, a company that switched out batteries for electric cars lost $500 million and was failure. The customer job is to decrease uncertainty. How do you sell it? Make big bets, big risks, where as innovate is cheaper. The first thing to do is to test the hypnosis – for example saving 20% on sales process. Use test card to fill in learning card and then fill in the progress board. This helps to reduce the risk and uncertainty. So how can we get companies to take smaller risks, focus on the customer job and delivering value? 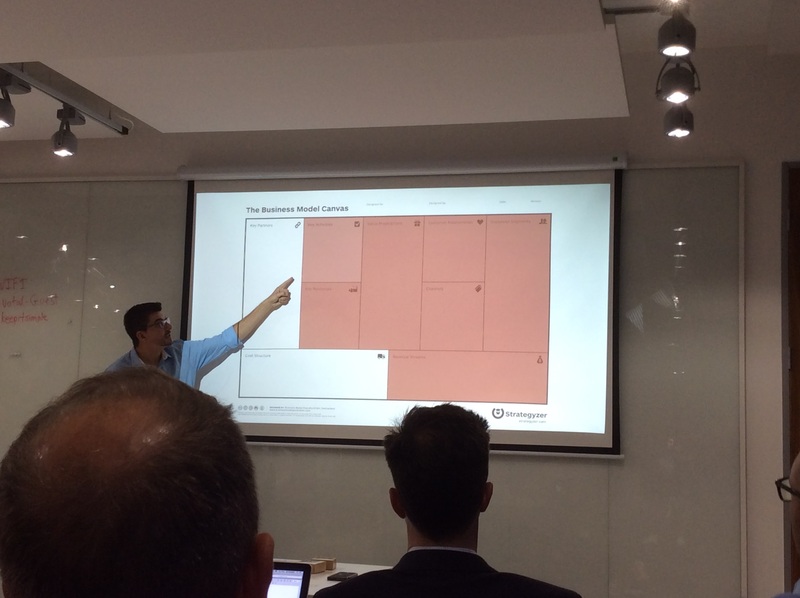 Make experiments in your project, use the map, understand your customer and do little experiments. Getting it working for one project and show the success. 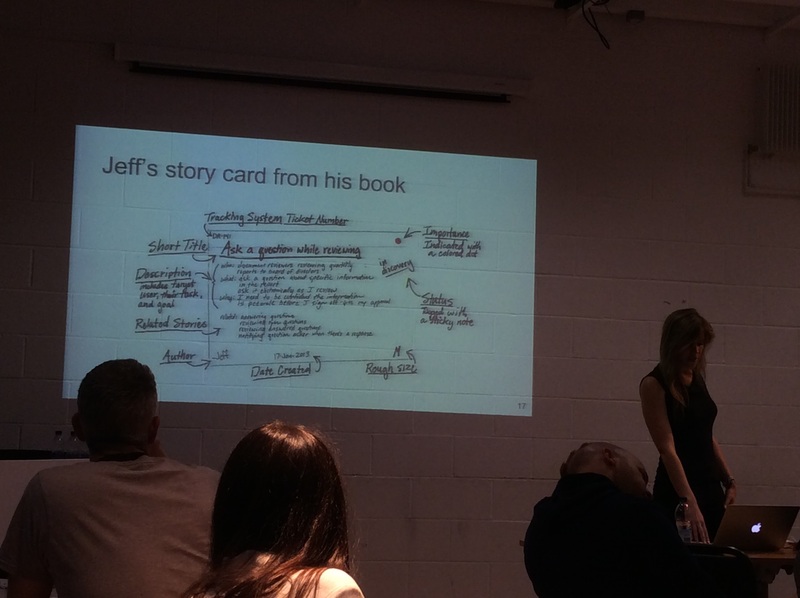 For Lynne the day Jeff Patton released the User Story Mapping book was a great day, maybe not so much for her boss as now everyone would know how to deliver the right thing! The exercise Lynne and Charlotte walked the group through was the “getting out of bed” and out the door game. You have 10-15 mins to plot out what you do in the mornings to the point you get out the door. To learn how to do a story map you should start with something you know. Think of a typical morning and use post it notes for each activity. 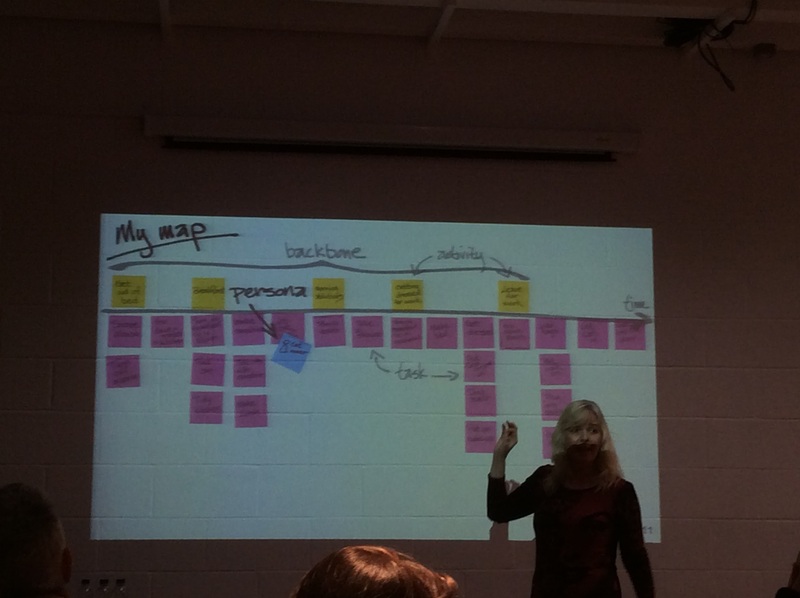 In groups of 3, people had to merge their maps and do it left to right timeline fashion, removing the duplicates. If you pull out the group headings, these are your backbone activities. As everyone has a slightly different routine are there any personas that stick out. This could be cat owners, people with teenagers or little kids. The tasks can be split further into sub-tasks. The goal is high level, activities are just above the land, the tasks are sea level and below the sea are the sub tasks. 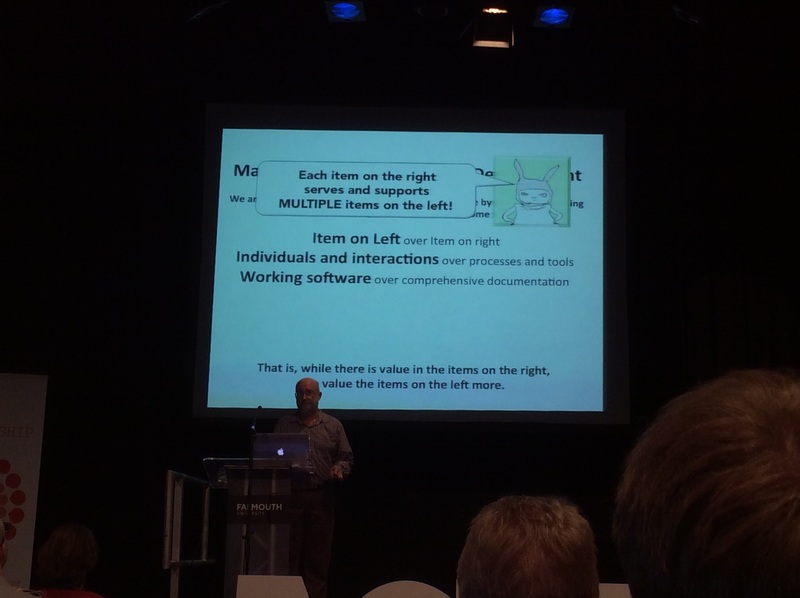 Kent Beck actually asks are requirements actually agile?! 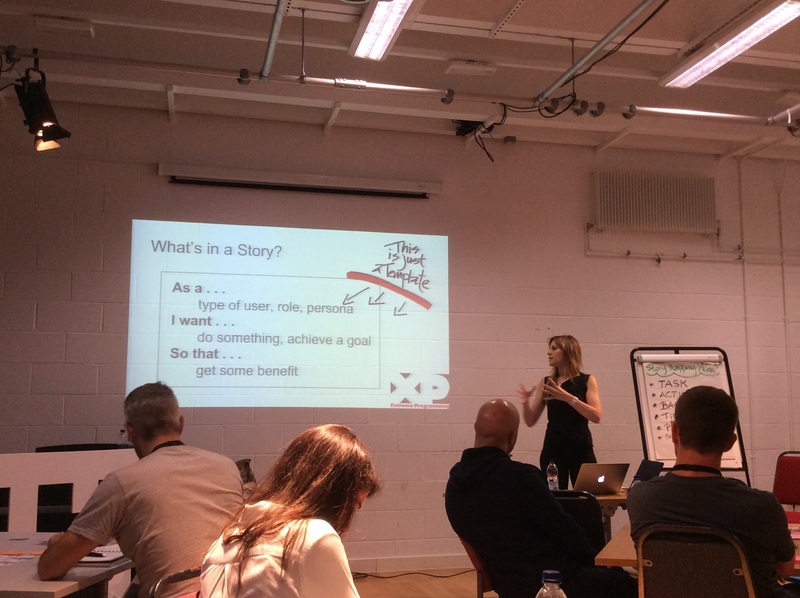 The word is wrong and hence these became user stories. 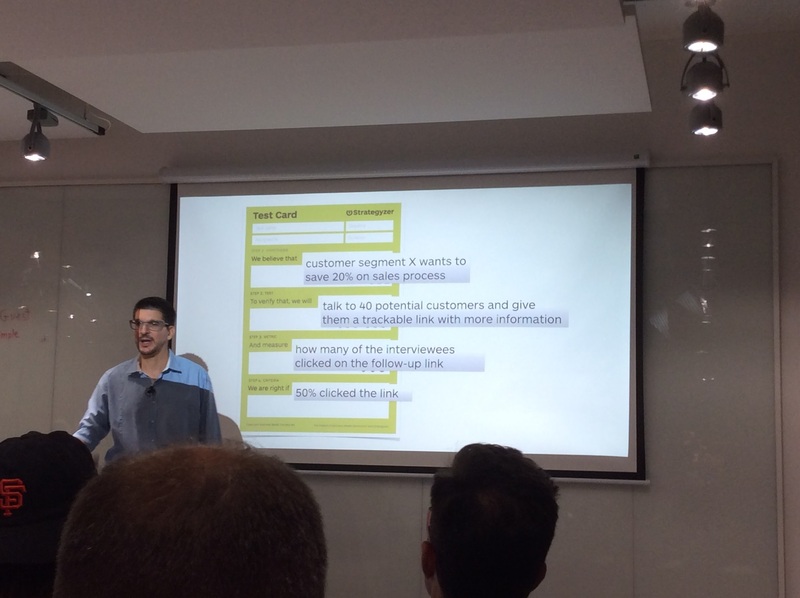 The user story adds the context and is a tool to get teams talking. These stories can be captured electronically using tools. Looking back at the merged story map then you need to play the ‘what if game?’. What if you don’t wake up and you have only 10 mins to get out the door. What are the musts? These stories go above the line and this is called splitting the map. 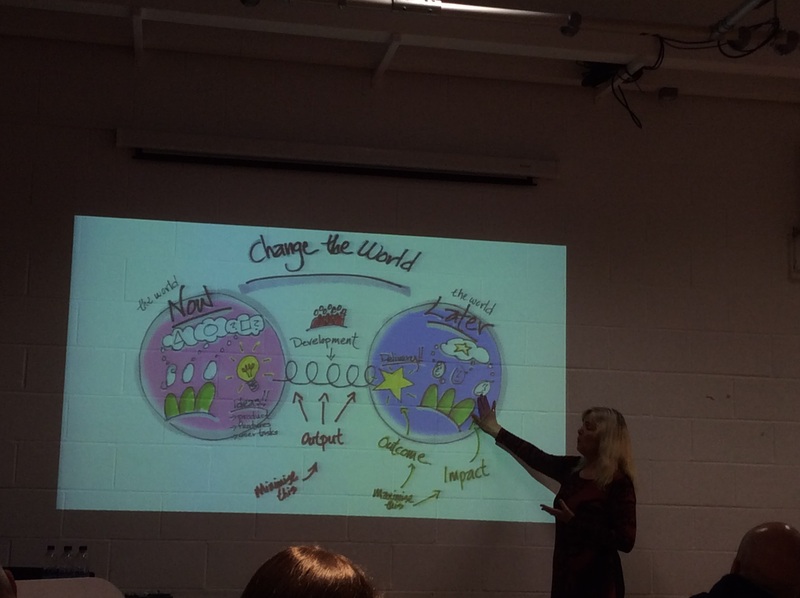 So how do you change the world? What does the world look like now and the world later. There is always too much to do so you need to minimise the output and choose the highest priority items to work on. If you are replacing an existing system, create an as is now map. Talk to the end users and learn what they need. From this you design the what’s the to be map? Go into details and you can create the 1st phase MVP followed by the 2nd phase MVP. The important thing is to get the backlog out. 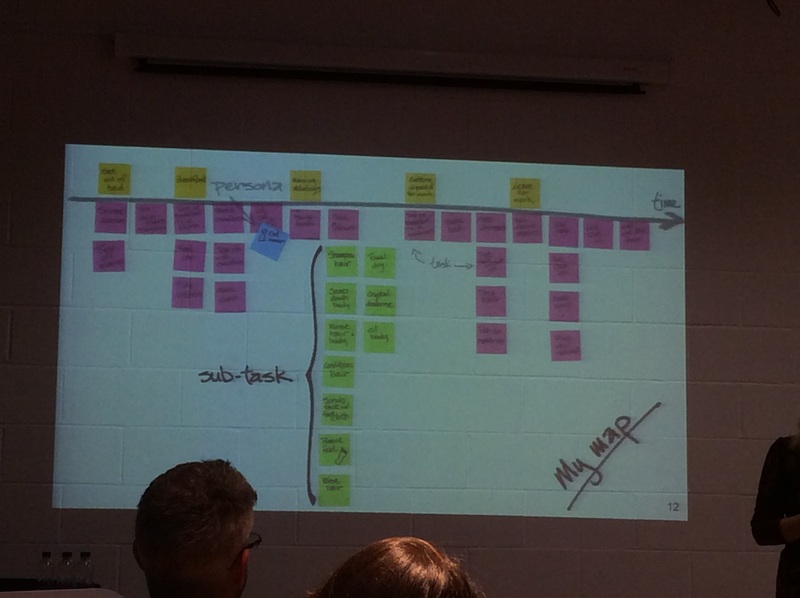 If you have an existing backlog you can have an user story mapping session to recreate the backlog as sometimes there is so much noise in existing backlog. 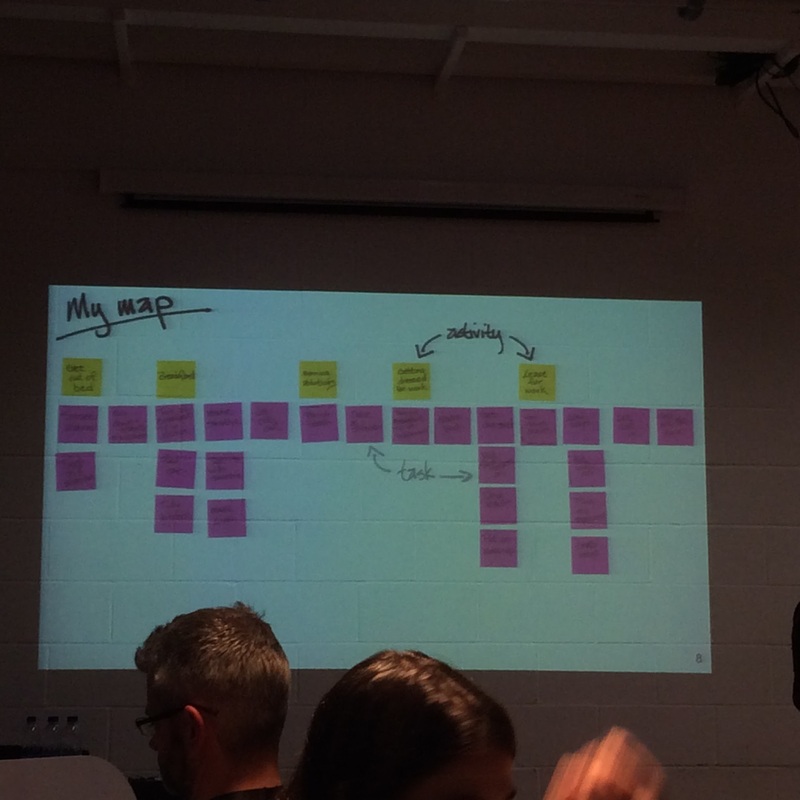 This was a great interactive session to give an insight into user story mapping, but I do wonder how you can get end users to help create this and get them to use post it notes! 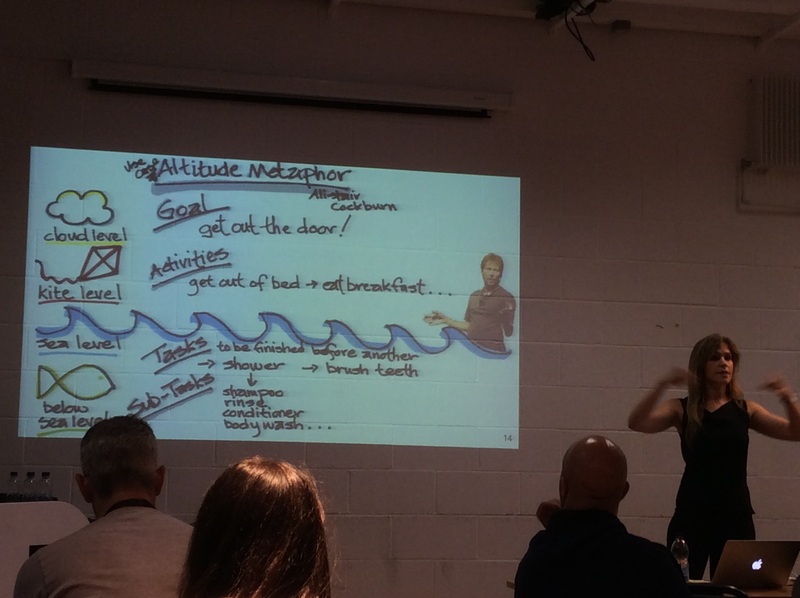 Jenni Jepsen talks about how neuroscience can support successful transformations to Agile, and is currently working on a book about how to apply knowledge about the brain to help people shift to a more Agile mindset. She starts by telling us that thinking happens in our Prefrontal cortex but needs things to be just right to work, not stressed, hungry or tired. The problem is we tend to use the Limbic system more. This is more the reactive part of the brain that contains long term memory, remembers old habits, rewards, pleasure, fear, prejudice. When someone asks you “Can I give you some feedback”, this sentence causes the same chemical release as seeing a bear and needing to run. 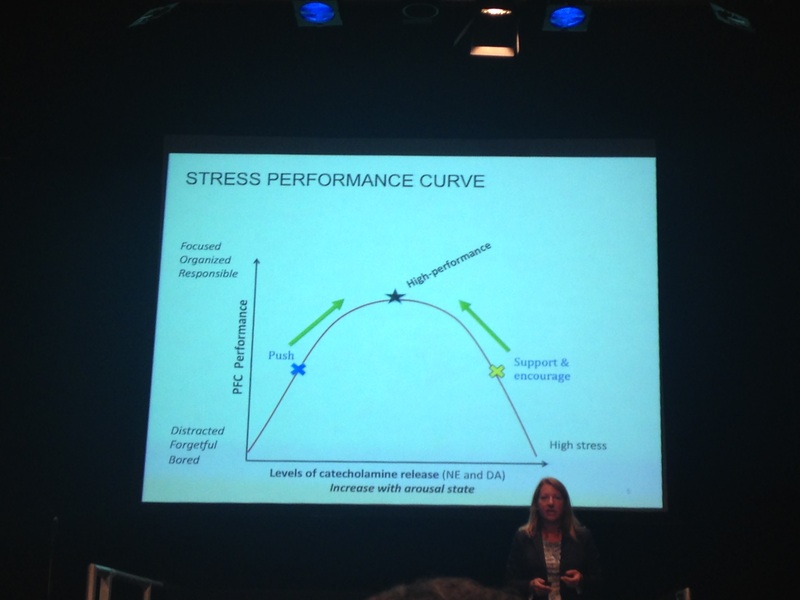 The more stress you have the more performance will go down. The Prefrontal cortex is focussed, organised, responsible if it is working if not the person becomes distracted, forgetful, bored. This is due to the levels of dopamine and norepinephrine being released. You may need to support and encourage people to high performance or sometimes need to create a little stress. To work optimally you need to have NE and DE at the right levels. 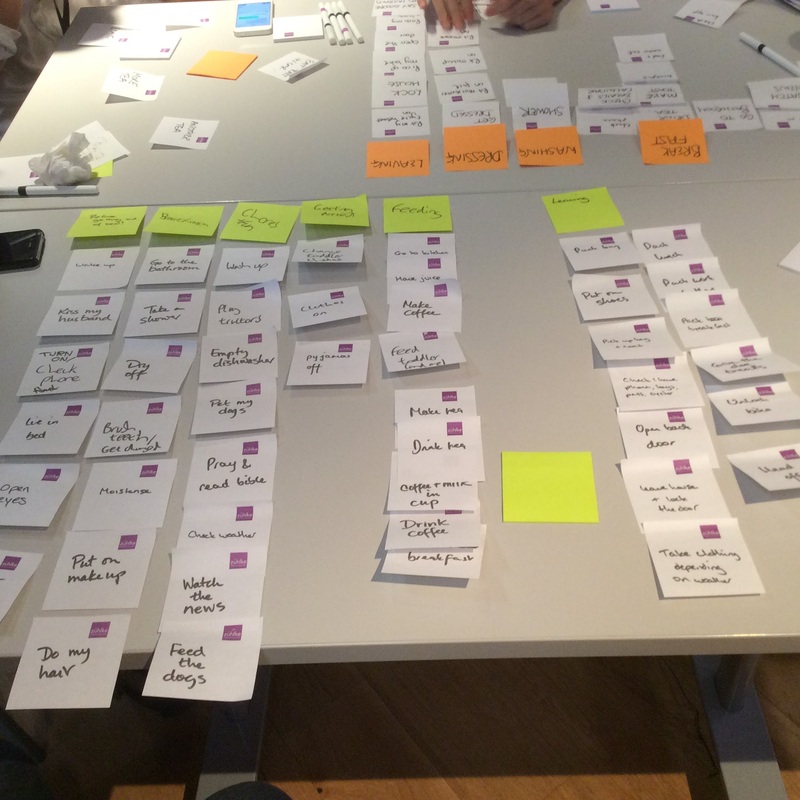 Having an overview and just in time planning is agile. No plan is chaos which means stress! The Limbic system can strengthens negative connections and that person will see world more negatively. If your stressed state last for 2 weeks, you will need 2 weeks to recover. If this stress lasts long term, your brain actually changes. Then you will need to focus on the positive to be able to bring people back to the ‘normal’ level, but this takes time. Naturally the brain has 5x more negative connections than positive. People are more willing to take risks, accept uncertainty when the prefrontal cortex (PFC) is working. If you need craftsmanship, this pushes you towards the PFC. The PFC is required for the great ideas. When you get a gut feeling, this is the brain recognising patterns, giving you that feeling but it doesn’t tell you why it’s making you feel this way. Change for the brain is novel. The first time you see something it may be scary so warns you to back away. 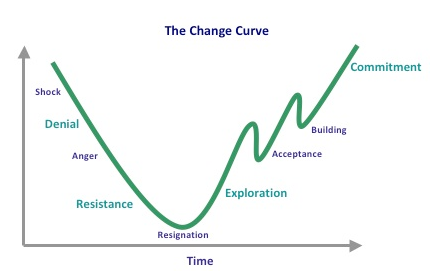 This means that humans will resist change and have lack of understanding of why they would want to change. They want to know what’s in it for me. If you help them to break down the change into small pieces this helps the brain to calm down. Run one experiment at a time, making sure that you involve and engage people. It is a lot easier for people to get on board with an idea, they may not agree but this is easier than for them to change. If you get feedback you need to say thank you for the feedback and eventually you will condition yourself to find it not a bad thing. There is a gene marker for stress! Work with people, empathise with them, give feedback, and then re-frame the situation (make positive). Jenni’s dad bought a new wallet at the airport and transferred money from the old one into the new one. Whilst doing this he left €20 on the side and got quite upset with himself for being so silly that he had managed to do this. You need to empathise, saying that it’s not great that he left the money behind, but wow, think about the person who found it. It must have made their day, maybe even their week. Re-frame the situation to be positive and this makes people less stressed. 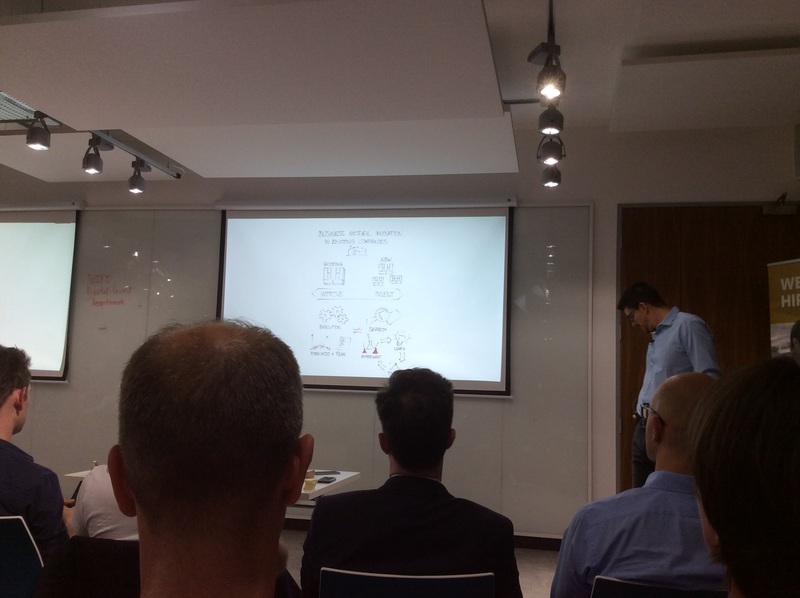 The session starts with everyone having to stand if they work in an agile environment, about 99% get up. 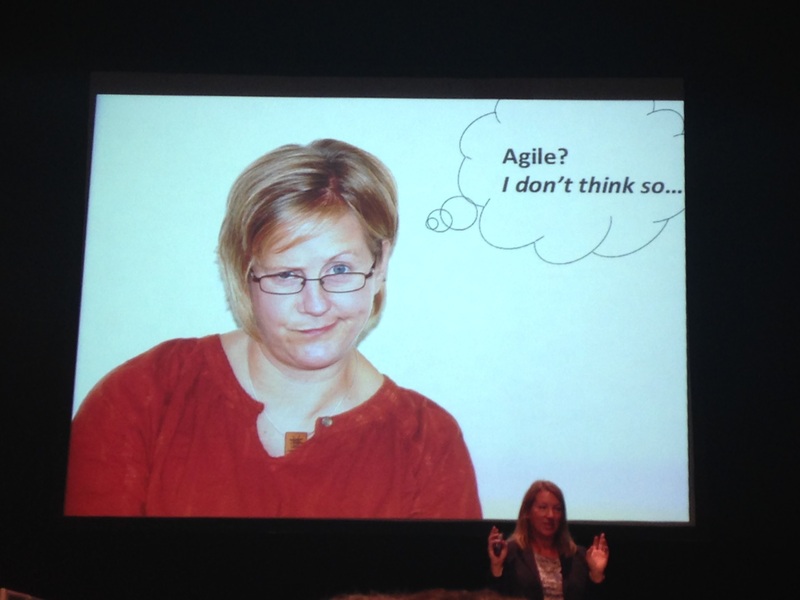 Then you’re asked to remain standing if you truly believe that you work in an Agile environment. About 90% of those standing sat down. So even we don’t believe that we really work in an Agile environment. So what is going on? 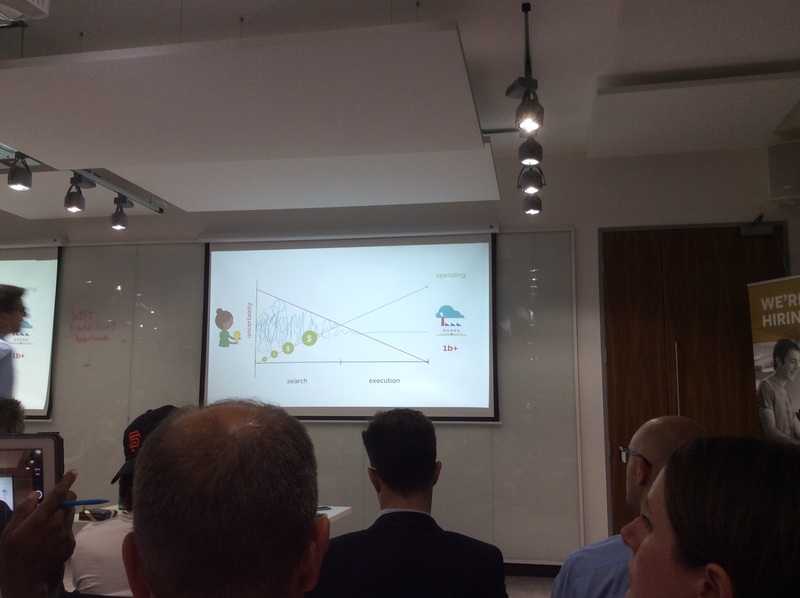 I believe agile has crossed the chasm, it’s been around for over 20 years and now it’s common place in almost every company that there is an agile transformation happening. This crossing the chasm by Geoffrey Moore is usually used about technology. A smart phone is a great example of a product that has gone through the product life cycle. Tech users were early adopters whereas now most phones are smart with just a few parents not owning them! A lot of companies are doing things differently, open salaries, no titles, no limitations on sick days or holidays. 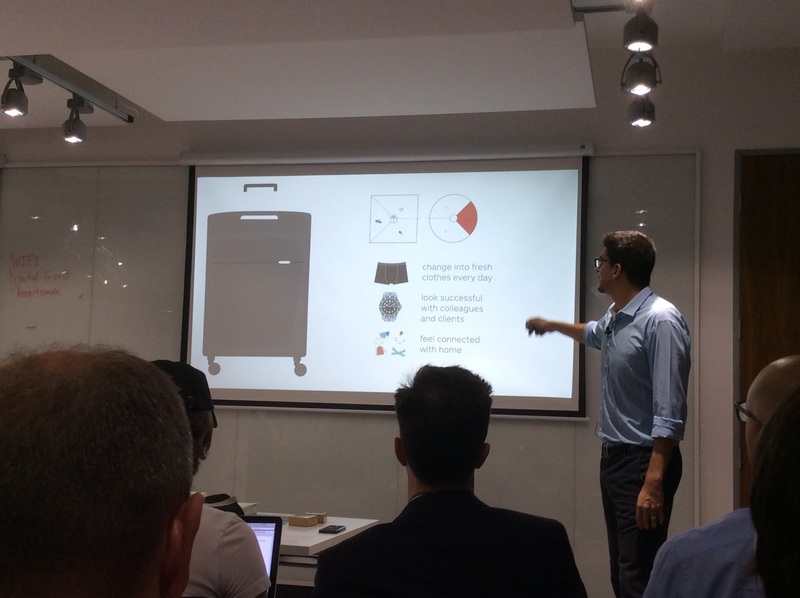 GCHQ have a platform similar to kickstarter where anyone can submit an idea for consideration and people can vote for the ideas. But people did not see all the times these companies failed, we only see and hear about the successes. Working in an Agile way takes time and commitment. Unless you have buy-in from the entire team you will never be truly agile. After all there is no I in team. Rock stars are often not team players, sharing knowledge amongst others. Would you rather have someone who says they know it all or that knows their weakness but still wants to help? Bigger teams encourages knowledge silos due to the large number of communication paths, if you have ten people in your team you have 45 communication paths. Adding people to a project at the point of realising that a project will run over will normally make it even later. Kanban boards promote visibility of work within teams. It helps to spread work amongst team members, making on time delivery much more likely. Vision statements are often missing from a project, start with this and then use this to confirm the goals, critical success factors with your stakeholders. All stories that are currently being worked on must be working towards that vision statement. Teams must pull together to reach these goals. 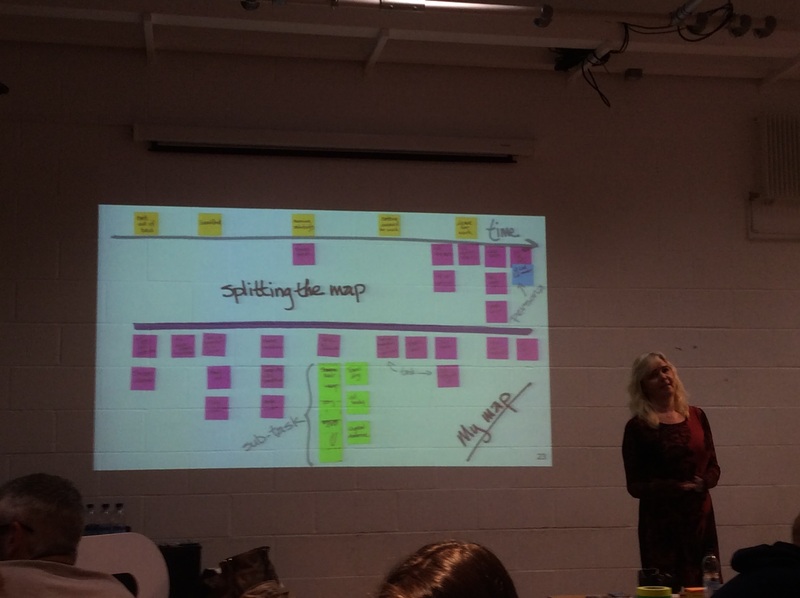 Story mapping can help ensure that all are pulling in the same direction. Teams need a shared understanding of the work being undertaken and the direction it will take them. You can learn a lot from David Brailsford. 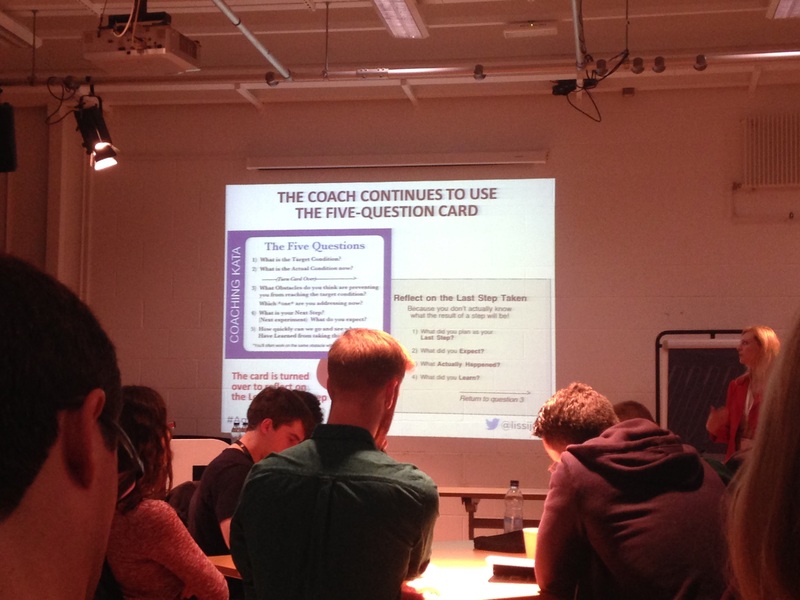 He used the core principle with the GB cycling team. By committing to one thing you will fail something else. You will achieve excellence in the one thing you focus on. You must own every aspect of the work needed to reach that goal and be responsible for reaching it. Marginal gains make the difference between good and awesome. Look at all areas of your plan / life and look for micro optimisations and waste reductions in order to make each item just 1% more efficient. They will all add up to something bigger than the sum of parts. The work environment is important to team moral and productivity. Use it to share knowledge by creating areas that ideas can be shared freely and openly. Smaller teams co-location by project has been most efficient. Mob and paired programming are good ways to build team morale, sharing skills and improving efficiency. Team training, be it a course, conference of lunch and learn build stronger teams. Without team building it will take time for a team to gel and to become more effective. A good way is to get all members out of the office and into an unfamiliar environment, that way no one is more comfortable ensuring everyone is on the same level playing field. 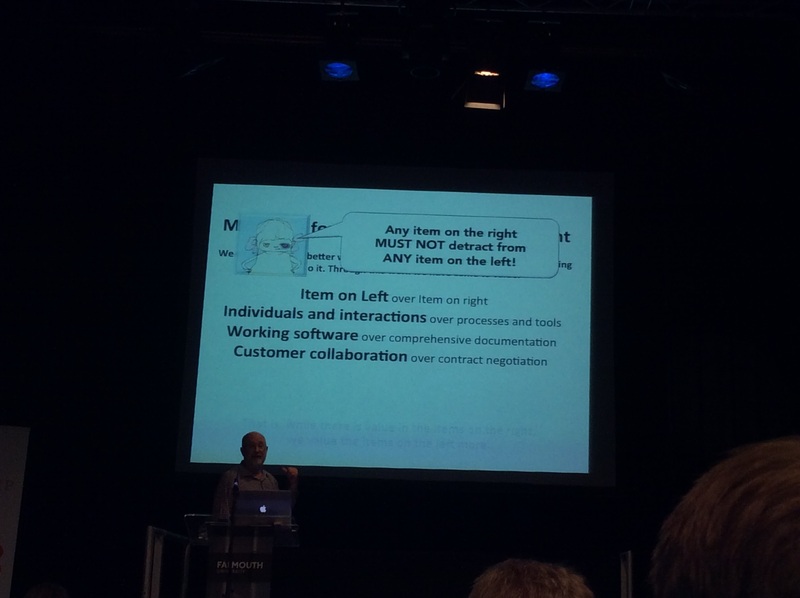 Fast / slow thinking and context switching need to be taking account when planing work. If you are always context switching then you never got to use your system 2 thinking. Track waste / non project time over the course of a project and reflect on it during the retrospective. This is a great way to capture some easy optimisations. 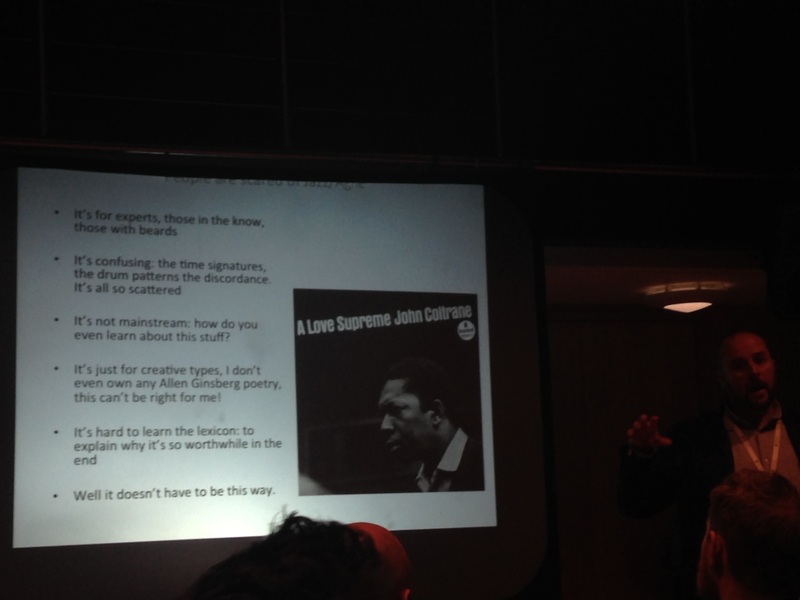 Part written by Tony Edwards who was actively blogging throughout the conference. The full talk is below. 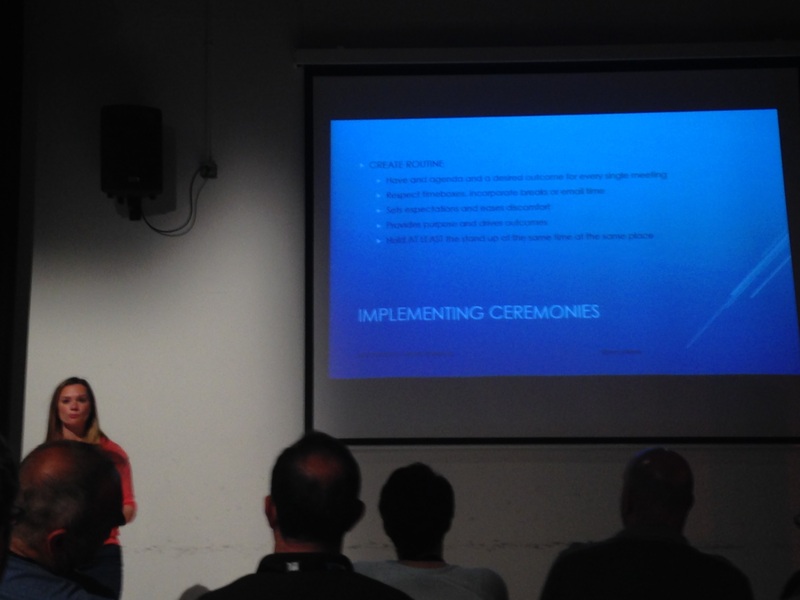 Amy is a scrum master and one that wants to see people actually implementing Scrum properly. When you want to transition you need to first prepare, then implement and adjust as the teams increase in maturity. There needs to be a common understanding of what the problem is. If people understand the issue then there tends to be increased buy in. When everyone understands the problem, the next step is to agree the strategy together. There needs to be the appropriate level of coaching applied, depending on where the team/company is. Be realistic with expectations as change is not easy and people will resist but keep going as it will be worth it! Always appreciated in the end! 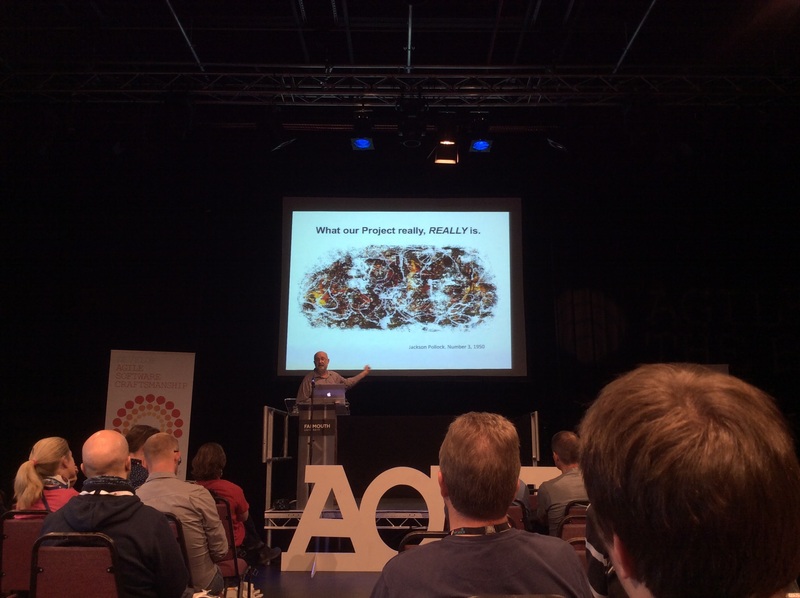 What’s the problem and why do you want to be agile – stop and think. Who wants to bring in scrum and why? Play sprint Tetris to help see how much can be done and highlight dependencies. Maturity comes with experience, keep going, inspect and adapt. 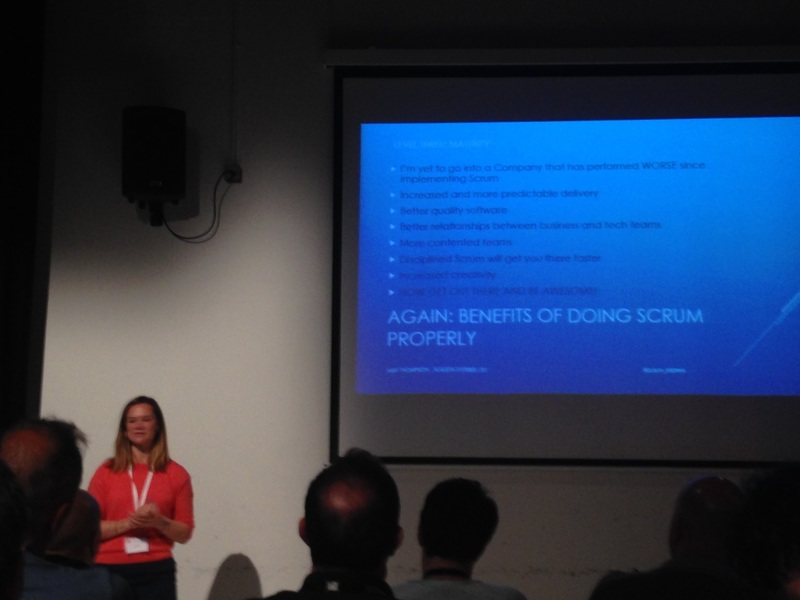 Amy is very passionate about what she does and one of the few coaches I think wouldn’t allow scrum but in an implementation. 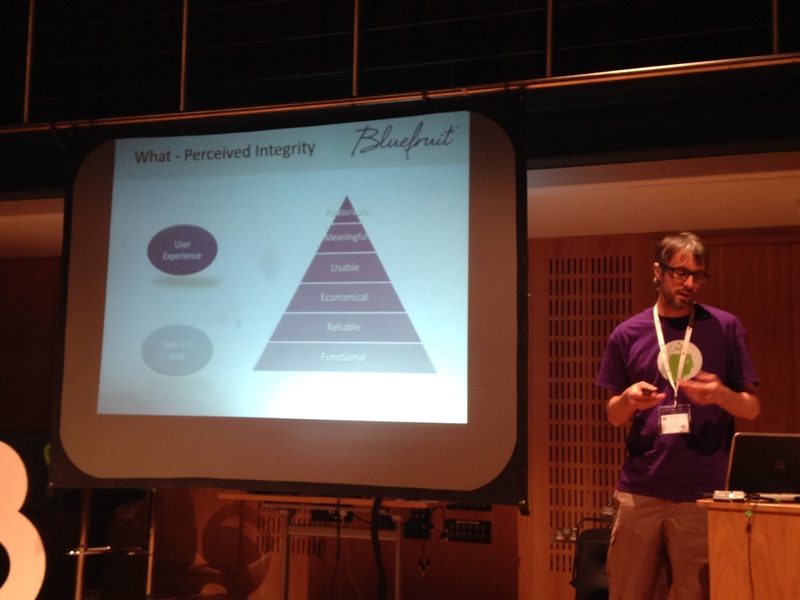 Bluefruit work on embedded software for various companies including Dyson. Paul learnt most of his agile knowledge from the book Lean software development by Mary and Tom Poppendieck. 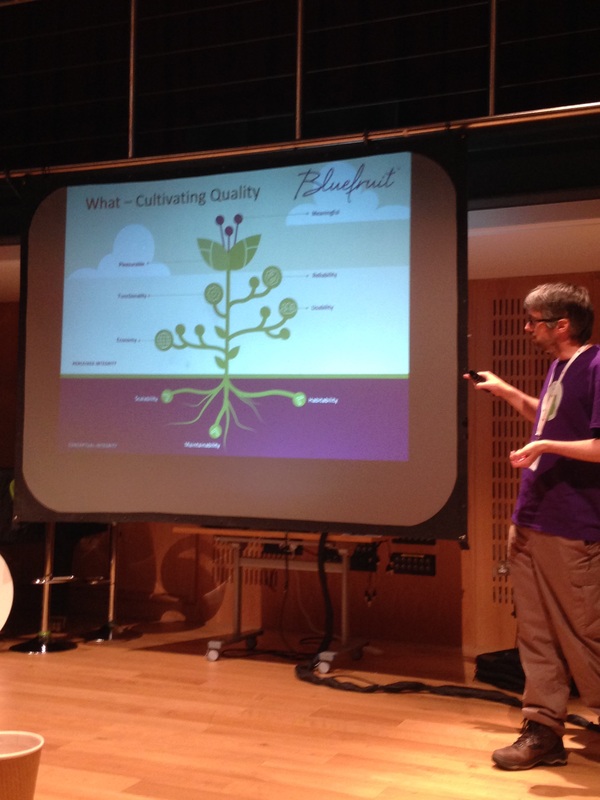 What does quality mean to people? Can you categorise these meanings? Lack of quality could be due to code, requirements or user expectation. Paul believes that quality has to be an integral part of a project, part of the iron triangle, so it is not only time, cost and scope. By putting quality first the Paul feels that the project will be delivered more successfully. When projects get difficult quality should not be compromised as this will cause the project to run more late and probably not deliver up to the required expectations. 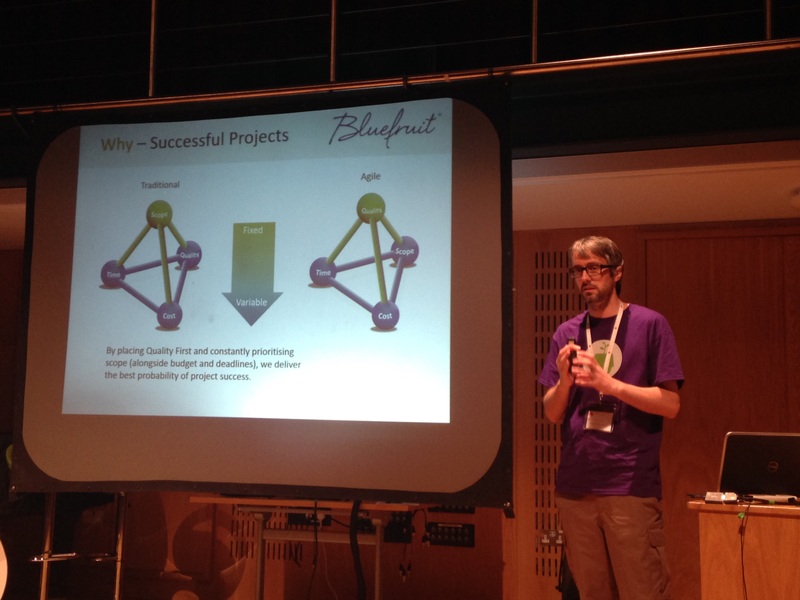 This is the model that Paul believes ensures that quality is embedded into the projects that Bluefruit work on. 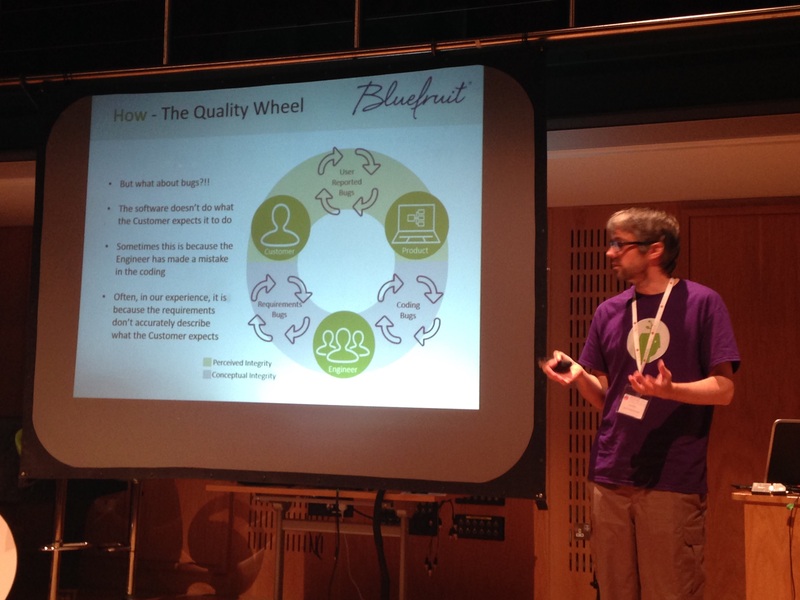 Paul wants the user experience to be slick and that whatever Bluefruit makes has both perceived and conceptual quality. 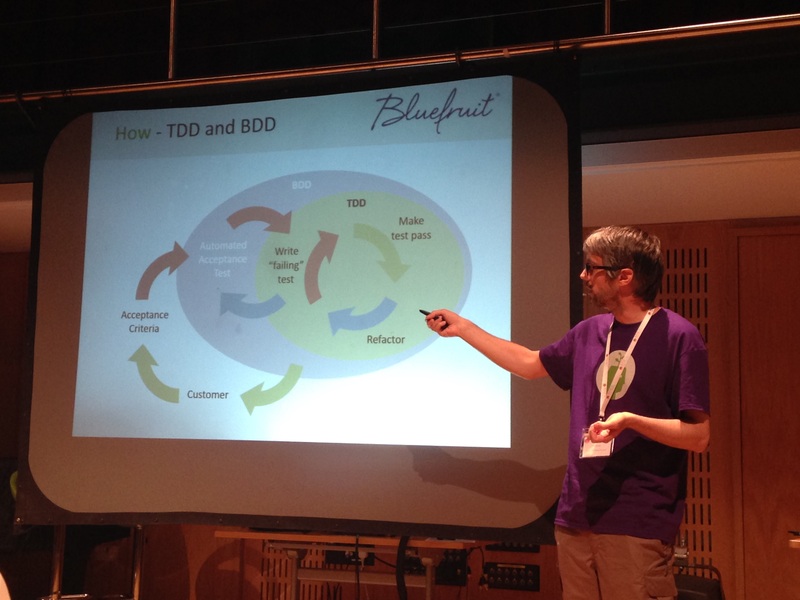 They use BDD and TDD to ensure they are not only building the right thing, but they are building it right. What they build must be scalable, habitable and maintainable. Paul strongly believes that quality pays and this is a Strategic goal (overall goal) not a just a tactical goal (how to get there). It’s a thinking, an approach a shift in culture. It is much more than processes and tools. 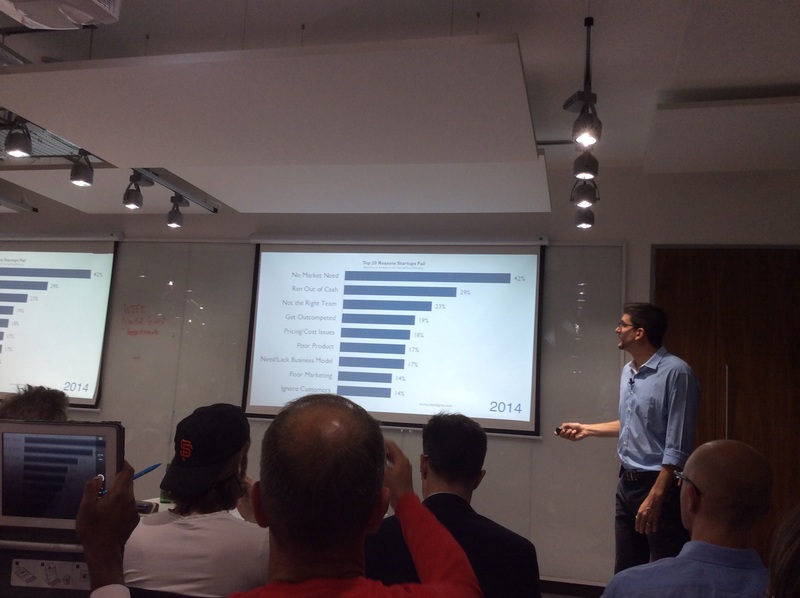 When Agile On The Beach first started it had a lot of help from European funding, around 80%. Last year was the first year that it was 100% privately funded, which is a great achievement. 20% effort creates 80% value. This means that you should focus on key channels. 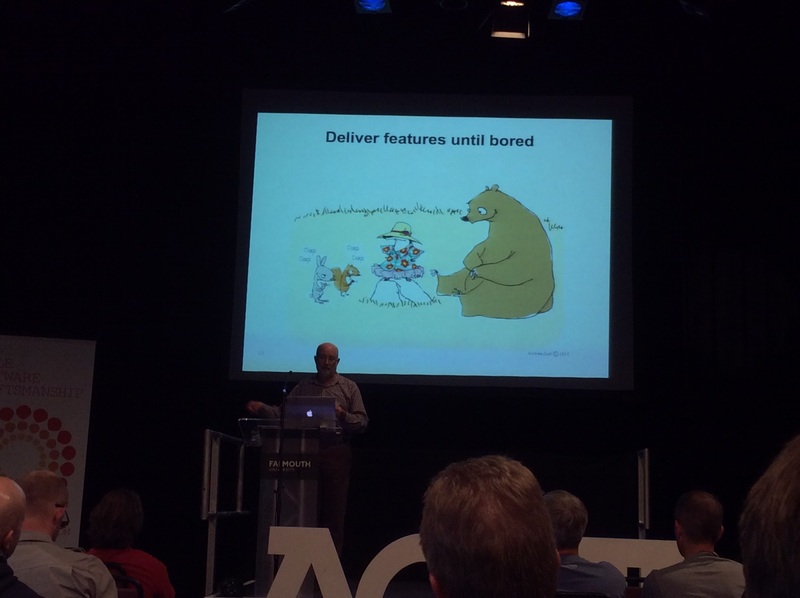 Agile addresses the pain point but will not deliver a perfect system first time. What it will allow you to do is to get something out earlier allowing you to collect feedback. This means that you end up with a better product in the long run that customers have influenced the direction of the final product. This is a slightly different shift in how you think. Need to ask yourself where is the value? Belinda actually does a demand driven approach when it comes to organising training sessions, she sells the tickets first and when there are enough people she will then book the trainer. 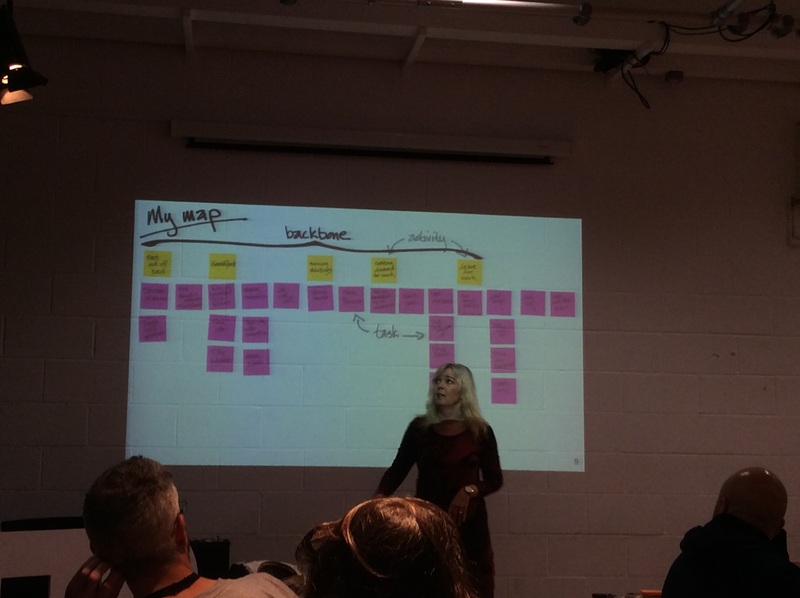 From working with different people, this gave her enough ideas and collateral to write about how she has helped businesses in Cornwall creating a book, being Agile in Business. 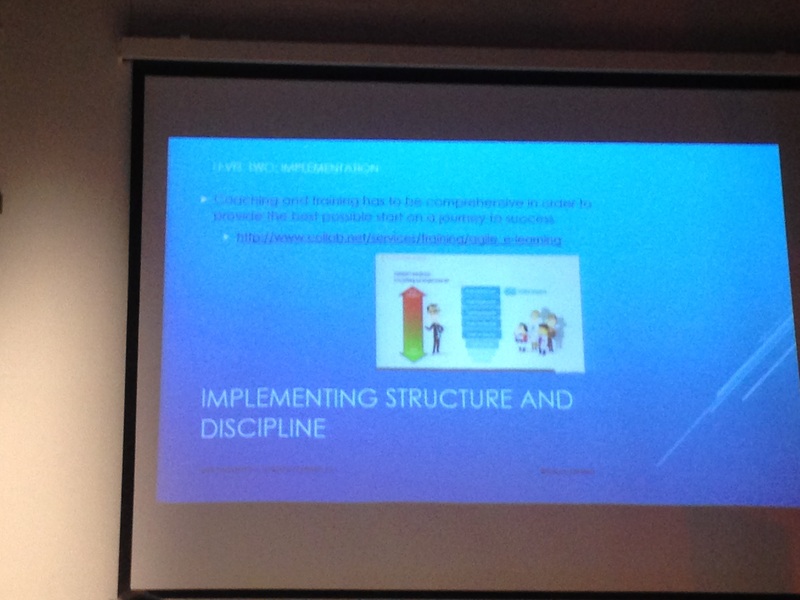 Her blog captures in more details how she created this book but this was done in an agile way. 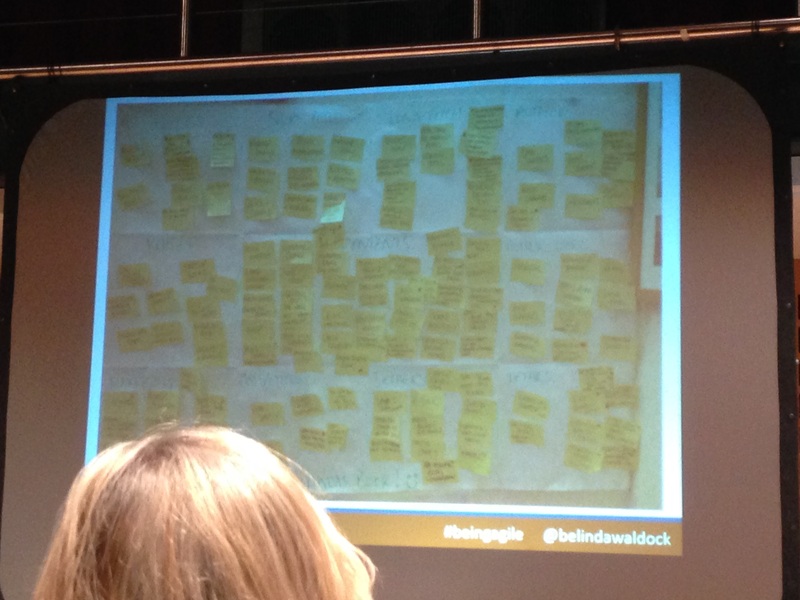 The first proposal of book was the sections and then the post it notes for potential contents of each section. She worked with her editor adapting the publishing process. She knows that if she had tried to write a book in the traditional way, spending six months writing, then this being reviewed and needing to be changed then things wouldn’t have worked and no book would have been created. It only took 16 weeks to write and publish the whole book! The book only needed 40000 words so Belinda could prioritise the post it notes in each section so not all contents made it. 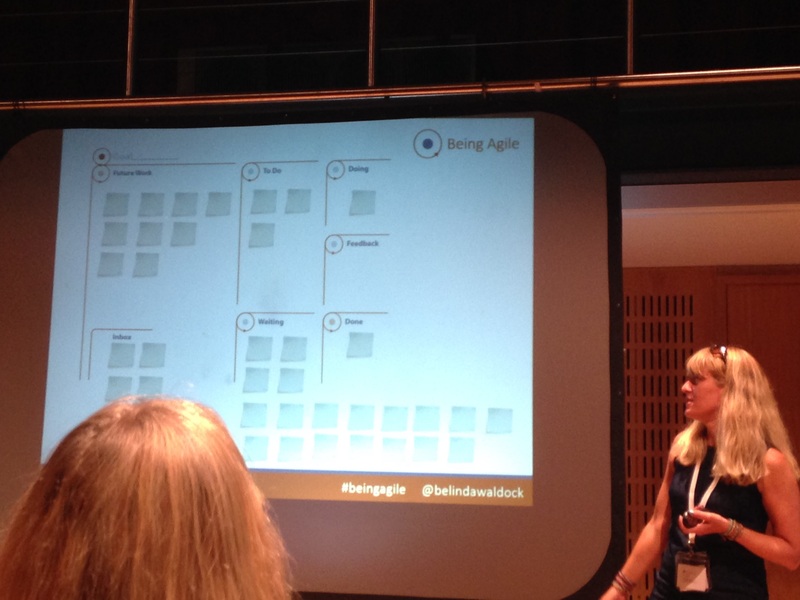 Writing her book in this way was an experiment to see if agile could be used in a more traditional environment. There was an interesting side effect of this experiment as the publishers liked this way of working and are still using it so Belinda writing her book helped this publishing team become more agile. The reason they liked it was due to the fact that they were given bit size chucks of text to review more often. These regular interactions actually decreased the amount of changes needed as Belinda and the Editor got more used to each other and what was required. This prevented any mass changes needing to be done. 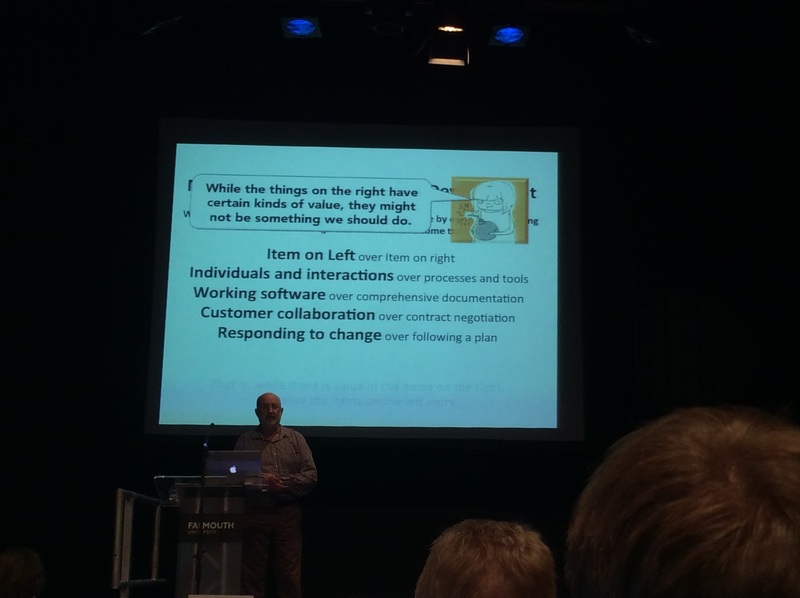 The Agile Manifesto talks about interactions over processes. 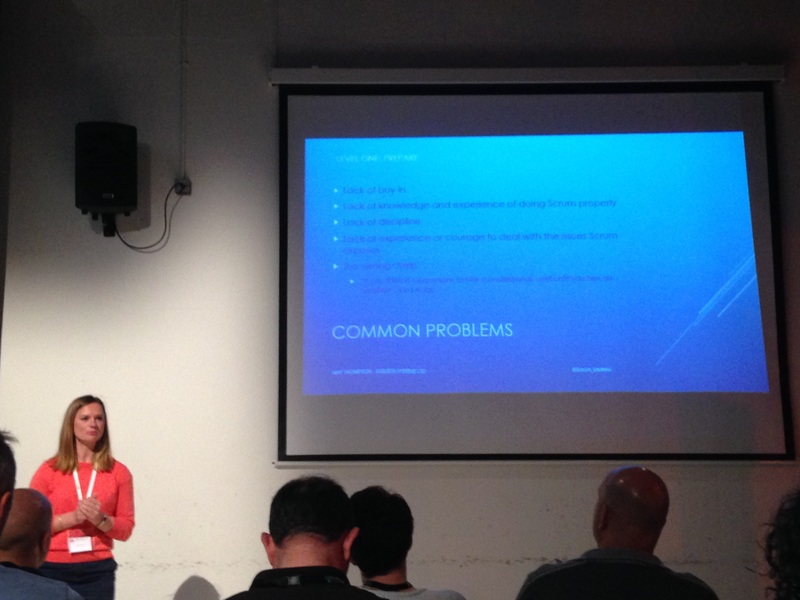 When Belinda works with teams she often uses the ship retrospective. This is looking at what makes you run faster, which is the wind in the sails but what is holding you back, the anchor. Then the team has to rack the post it notes from -10 to +10 (the – is holding you back, the + is making you go faster) per person. This allows the team to see what the key things are and from this, then create the actions. This allows time to look back on the last iteration and gives an opportunity for the team to feedback to others how they are feeling. When Belinda works with businesses she tells them that 80% of their time should be spent running the business and 20% of their time should be spent improving the business. 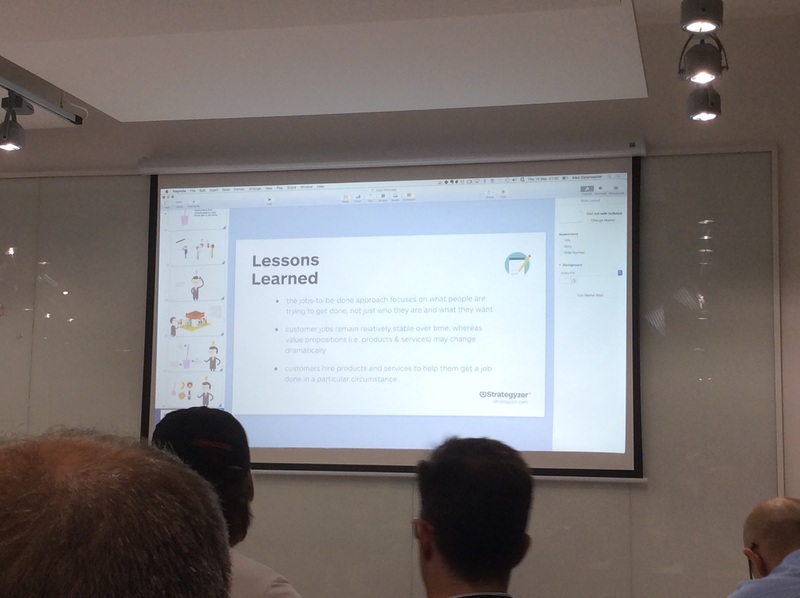 She is a big believer of visualising your work, be proud of what you do and encourages people to use Kanban boards, whether you are a team or just working alone. These boards are used to prioritise the ideas and indirectly will help people to work together, showing everyone what items people are working on. By using boards this can help people to work as a team a bit more as they are discussing their work together and hopefully coming up with solutions as a team. One of the ways she knows that she has helped a business is when she sees things that she has suggested being used in a new way. 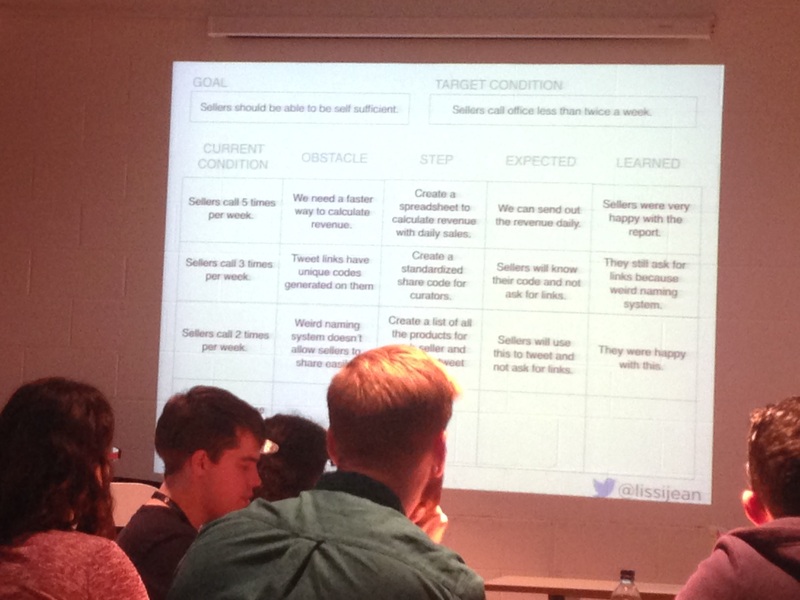 One company was using the sailing boat to visualise whether the company should move into a new area of working, highlighting the things that could be good and the things that were holding them back from expanding. Belinda worked with a company called Glitterarty. They create hairbands and things to help you style your hair. One of their loyal customers requested a monthly box to be sent to them, a box of goodies each month. This also allowed the company to get rid of bits of odd stock but was a lovely treat for the subscribers. This monthly box actually created a community of people by utilising social media. 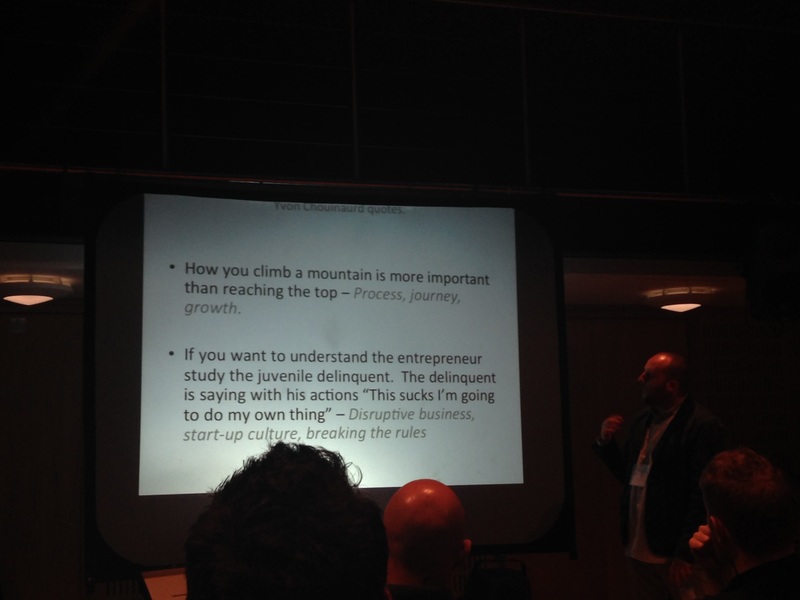 This allowed the company to build a product and adapt it. Then the regular subscribers provided enough steady funds that allowed the company to scale. You need to have a plan but accept that the plan will change. You will not stay on course but there does need to be an original plan. To keep existing there needs to be a response to change. The Kanban board is very valuable and you should listen to the board, paying attention to what it’s telling you. If you need to change the board take a step back and ask why. Normally it is a change to process that is required rather than a change the board. 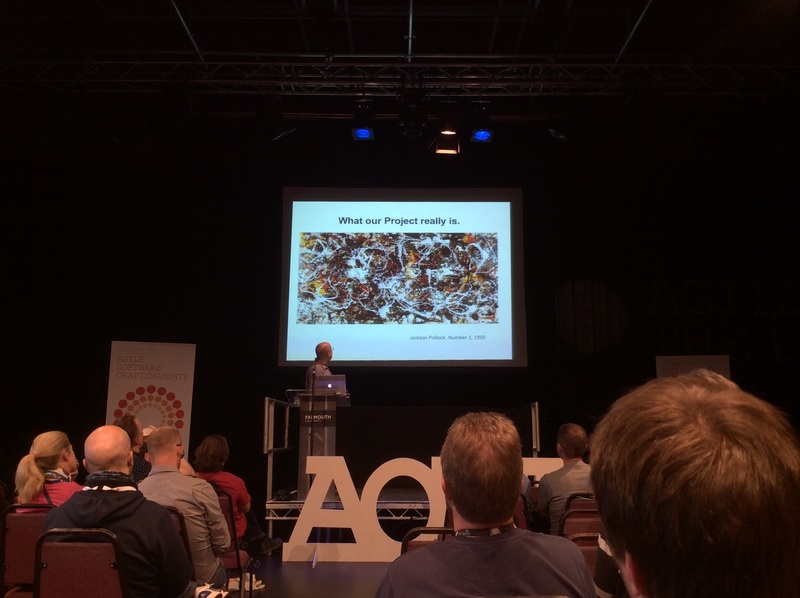 The benefit of Agile is that it shows you the problems and then you can use this information to fix the problems. This allows people to focus on their real job which in turn makes them happier. The increased visibility provides an environment for people to communicate better. 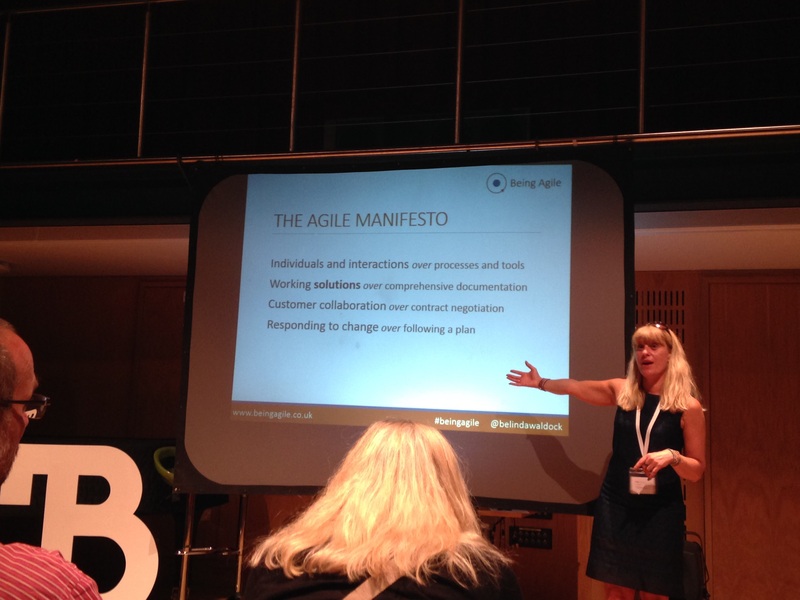 The change Belinda would do to the Agile Manifesto is to change it to working solutions rather than working software as software is not always what is required. 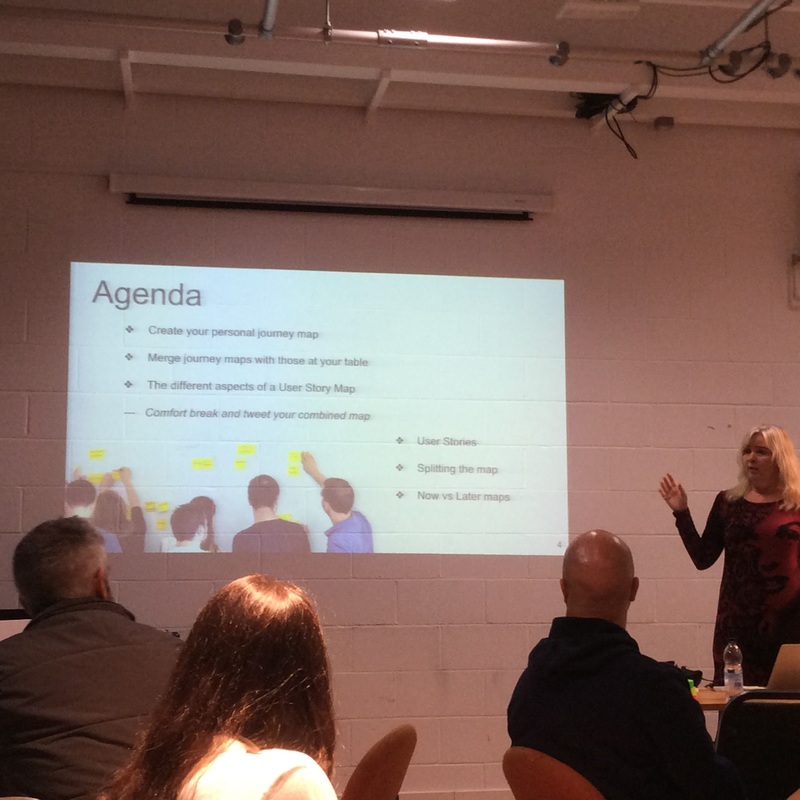 Melissa is an agile coach working with companies to help them identify the right things to improve and limit the things they are improving so they can see how small incremental improvements can make a big difference. 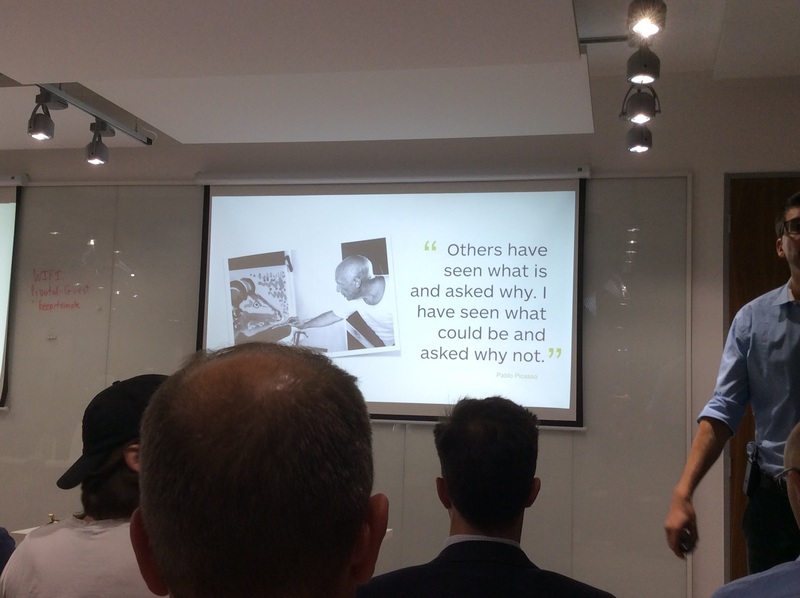 Melissa has looked at the lean way of working to get inspiration and ideas on how to help companies improve the way they work and how they deliver. A useful thing to do after the kata has been done then is to ask the people in the team the five question card and reflect on the last step taken. This should become a ritual, repeat until it becomes habit, part of everyday life. Does the product you are working on have a kata? 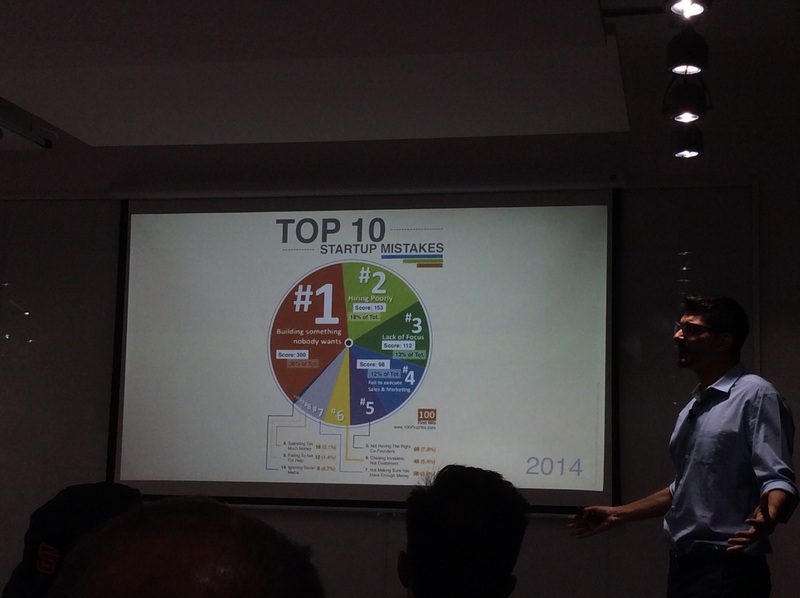 Do you know what the company goal is, or what product KPIs should be captured, what is the wanted future state. These things should be made clear as it’s hard to work to change and improve something if you don’t know where you are going or what it was like to begin with. If you are working on a project look at what are users doing now. Think about how you could measure this. Metrics need to be captured to baseline the as is situation but make sure you capture the right metrics. What is important to the business, what is the target condition therefore what do we want to improve. 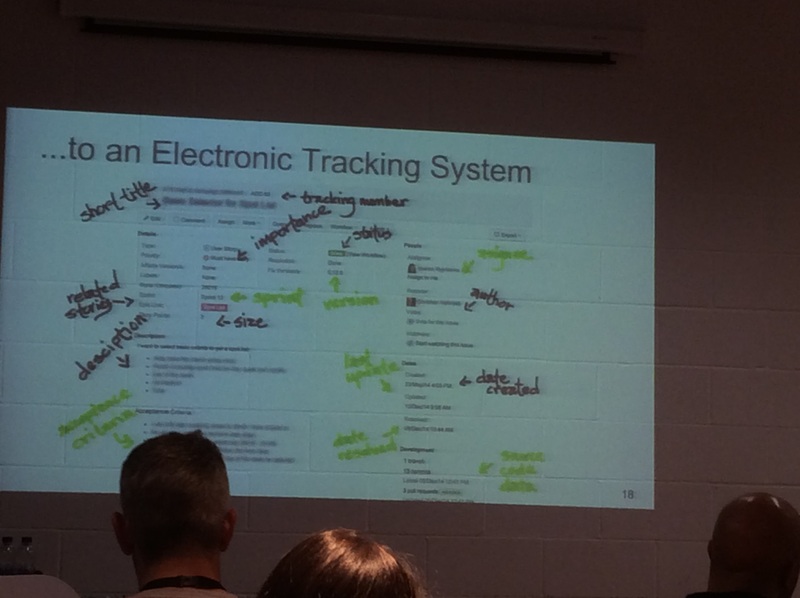 Some of the ways to capture this information is via user research or product experiments. Your target condition may be that you want to retain customers. This could be achieved in several ways either by converting freemium (free users to premium) users or by making it faster to on-board users. You need to plan towards a goal. This goal will not be linear, there is a need to iterate and get feedback. You need to not ask people what they want but instead what they are trying to achieve, by changing what factors could help achieve this outcome, then working out the smallest thing that can be done to test this theory. Find out what the problems are and fix these, rather than asking what they want. Start with goal; this aligns the vision for the team. Complete the target condition (Critical success factor) – sellers call office less than twice a week. What is the obstacle – we don’t know how often the sellers are calling. What is the simplest step can be done to overcome the obstacle – measure how often they are calling over the next week just using pen and paper and do a tally. Obstacle – we don’t know why are they calling? Step – What is the simplest thing we can do to work out why the sellers are calling? Ask the office staff why they are calling most for and write this down on pen and paper. 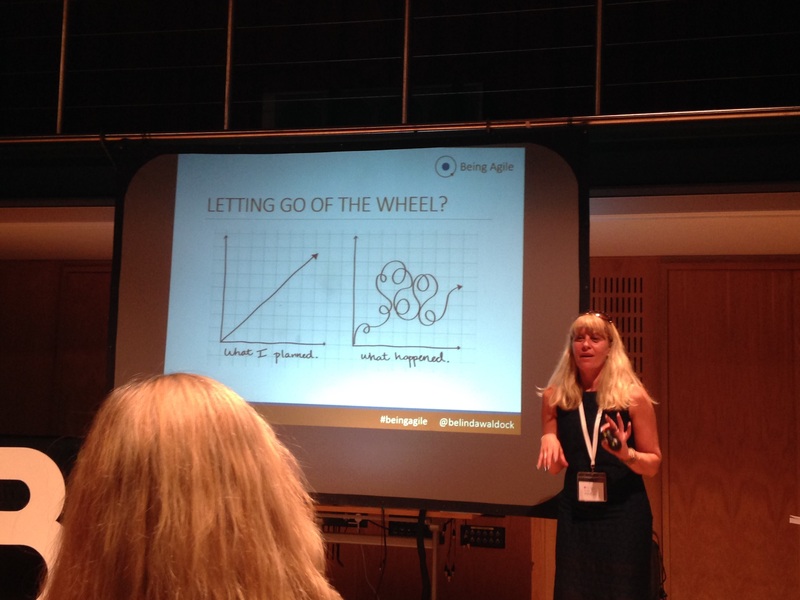 Now just pick one thing to improve – did it make a difference? 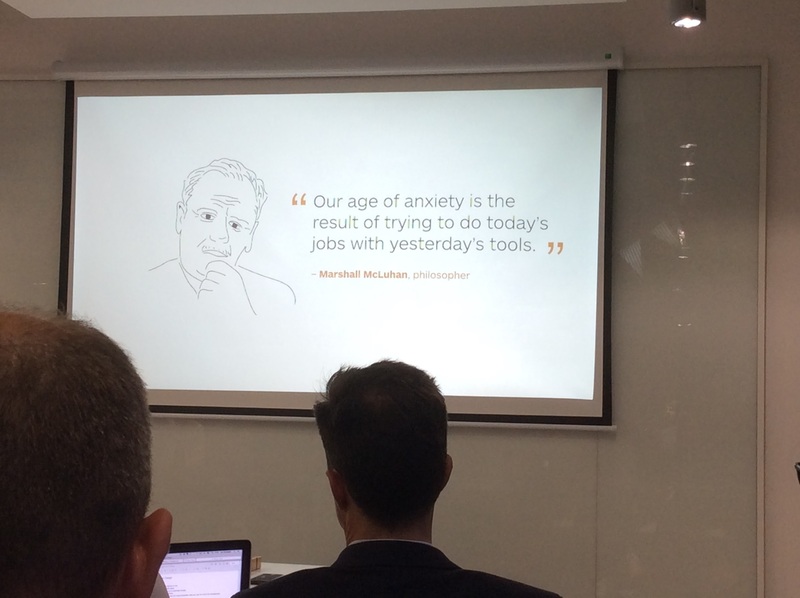 Do things in a manual way first, see if it makes a difference and then automate. Focused on the revenue first and gave the sellers weekly spreadsheets with their revenues. Then they learnt that the sellers really liked this but they wanted to know daily how much they are making, not weekly. The next thing on the list was to look at what are the sellers selling most? 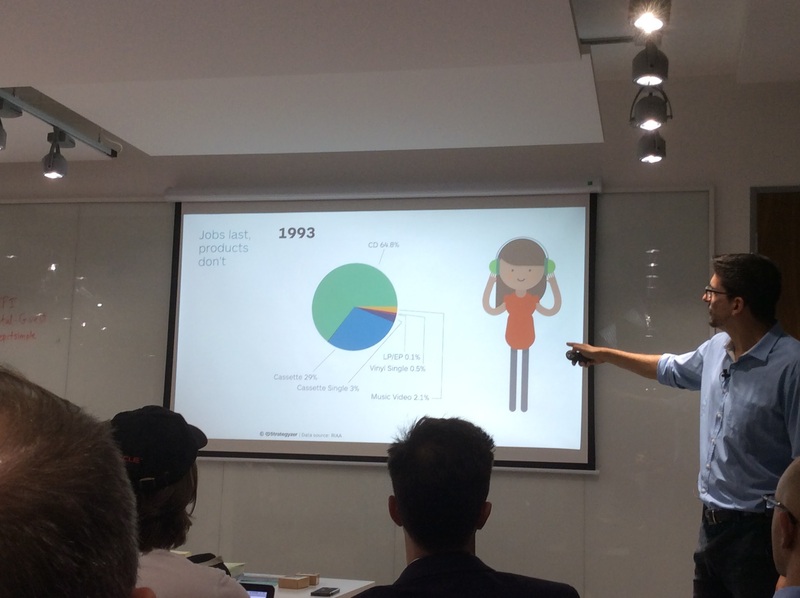 By iterating they reached the target goal of getting the sellers to only call in twice a week and they had not even gone through the top 3 reasons why sellers called. All this was learnt in 3 weeks of running manual experiments then it took one month to automate these changes. This allowed the office workers to do more interesting stuff! These steps are the lean version of MVPs, spending a small amount of effort to learn about your customers. Coming up with an experiment – hard to start but practice makes easier. Think small. What can you do in a day, max one week. How can you help the team? Get them to come up with an experiment, how long will it take and then reduce the time. Do manually first and then automate. Don’t spend time automating until you know what the right thing to do is.